The aggregate market value, as of the last business day of the most recently completed second fiscal quarter, of the voting and nonvoting equity held by nonaffiliates of the registrant was approximately $14,900,000,000. Portions of the Proxy Statement of Registrant for use in connection with the Annual Meeting of Stockholders to be held July 26, 2018, are incorporated by reference into Part III of this report. Brown-Forman Corporation (the “Company,” “Brown-Forman,” “we,” “us,” or “our” below) was incorporated under the laws of the State of Delaware in 1933, successor to a business founded in 1870 as a partnership and later incorporated under the laws of the Commonwealth of Kentucky in 1901. We primarily manufacture, bottle, import, export, market, and sell a wide variety of alcoholic beverages under recognized brands. We employ over 4,800 people on six continents, including approximately 1,300 people in Louisville, Kentucky, USA, home of our world headquarters. We are the largest American-owned spirits and wine company with global reach. We are a “controlled company” under New York Stock Exchange rules because the Brown family owns more than 50% of our voting stock. Additionally, taking into account ownership of shares of our non-voting stock, the Brown family controls more than 50% of the economic ownership in Brown-Forman. 2The Jack Daniel’s Single Barrel Collection includes Jack Daniel’s Single Barrel Select, Jack Daniel’s Single Barrel Barrel Proof, Jack Daniel’s Single Barrel Rye, and Jack Daniel’s Single Barrel 100 Proof. 3New brand launched in September 2017. 4While Korbel is not an owned brand, we sell Korbel products under contract in the United States and other select markets. See “Item 7. Management’s Discussion and Analysis of Financial Condition and Results of Operations – Results of Operations – Fiscal 2018 Brand Highlights” for brand performance details. Our vision in marketing is to be the best brand builders in the industry. We build our brands by investing in programs that we believe create enduring connections with our consumers. These programs cover a wide spectrum of activities, including media (TV, radio, print, outdoor, and, increasingly, digital and social), consumer and trade promotions, sponsorships, and homeplace programs at our distilleries and our winery. We expect to grow our sales and profits by consistently delivering creative, responsible marketing programs that drive brand recognition, brand trial, brand loyalty, and, ultimately, consumer demand around the world. Our distribution network, which we sometimes refer to as our “route-to-consumer” (RTC), takes a variety of forms, depending on (a) a market’s laws and regulatory framework for trade in beverage alcohol, (b) our assessment of a market’s long-term attractiveness and competitive dynamics, (c) the relative profitability of distribution options available to us, (d) the structure of the retail and wholesale trade in a market, and (e) our portfolio’s development stage in a market. As these factors change, we evaluate our RTC strategy and, from time to time, adapt our model. In the United States, which generally prohibits spirits and wine manufacturers from selling their products directly to consumers, we sell our brands either to distributors or (in states that directly control alcohol sales) to state governments that then sell to retail customers and consumers. Outside the United States, we use a variety of RTC models, which can be grouped into three categories: owned distribution, partner, and government-controlled markets. We own and operate distribution companies in 14 markets: Australia, Brazil, Canada, China, Czechia, France, Germany, Hong Kong, Korea, Mexico, Poland, Spain, Thailand, and Turkey. In these markets, and in a large portion of the Travel Retail channel, we sell our products directly to retailers, to wholesalers, or, in Canada, to provincial governments. Over the past decade, we began distribution operations in multiple markets outside the United States, as shown in the table below. In the United Kingdom, we partner in a cost-sharing arrangement with another supplier, Bacardi Limited, to sell a portfolio of both companies’ brands. In many other markets, including Russia, Japan, Italy, and South Africa, we rely on others to distribute our brands, generally under fixed-term distribution contracts. We believe that our customer relationships are good. We believe our exposure to concentrations of credit risk is limited due to the diverse geographic areas covered by our operations. Holiday buying makes the fourth calendar quarter (generally, our third fiscal quarter) the peak season for our business. Approximately 31%, 30%, and 31% of our net sales for fiscal 2016, fiscal 2017, and fiscal 2018, respectively, were in the fourth calendar quarter. Trade information indicates that we are one of the largest global suppliers of premium spirits. According to International Wine & Spirit Research (IWSR), for calendar year 2017, the ten largest global spirits companies controlled less than 20% of the total global market for spirits (on a volume basis). While we believe that the overall market environment offers considerable growth opportunities for us, our industry is now, and will remain, highly competitive. We compete against many global, regional, and local brands in a variety of categories of beverage alcohol, but our brands compete primarily in the industry’s premium-and-higher price categories. Our competitors include major global spirits and wine companies, such as Bacardi Limited, Becle S.A.B. de C.V., Beam Suntory Inc., Davide Campari-Milano S.p.A., Diageo PLC, LVMH Moët Hennessy Louis Vuitton SE, Pernod Ricard SA, and Rémy Cointreau. In addition, particularly in the United States, we increasingly compete with national companies and craft spirit brands, many of which are recent entrants to the industry. Brand recognition, brand provenance, quality of product and packaging, availability, flavor profile, and price affect consumers’ choices among competing brands in our industry. Several factors influence consumers’ buying decisions, including: advertising; promotions; merchandising in bars, restaurants, and shops; expert or celebrity endorsement; social media and word of mouth; and the timing and relevance of new product introductions. Although some competitors have substantially greater resources than we do, we believe that our competitive position is strong, particularly as it relates to brand recognition, quality, availability, and relevance of new product introductions. The principal raw materials used in manufacturing and packaging our distilled spirits, liqueurs, RTD products, and wines are shown in the table below. 1Polyethylene terephthalate (PET) is a polymer used in non-glass containers. Currently, none of these raw materials are in short supply, but shortages could occur. From time to time, our agricultural ingredients (agave, barley, corn, grapes, malted barley, and rye) could be adversely affected by weather and other forces out of our control that might constrain supply. Whiskeys, certain tequilas, and other distilled spirits must be aged. Because we must schedule production years in advance to meet future demand for these products, our inventories of them may be larger in relation to sales and total assets than in many other businesses. Our intellectual property rights include trademarks, copyrights, proprietary packaging and trade dress, proprietary manufacturing technologies, know-how, and patents. Our intellectual property, especially our trademarks, is essential to our business. We register our trademarks broadly – some of them in every country where registration is possible. We register others where we sell or expect to sell our products. We protect our intellectual property rights vigorously but fairly. We have licensed some of our trademarks to third parties for use with services or on products other than alcoholic beverages, which we believe enhances the awareness and protection of our brands. Federal, state, local, and foreign authorities regulate how we produce, store, transport, distribute, and sell our products. Some countries and local jurisdictions prohibit or restrict the marketing or sale of distilled spirits in whole or in part. In the United States, at the federal level, the Alcohol and Tobacco Tax and Trade Bureau of the U.S. Department of the Treasury regulates the spirits and wine industry with respect to the production, blending, bottling, labeling, sales, advertising, and transportation of beverage alcohol. Similar regulatory regimes exist at the state level and in most non-U.S. jurisdictions where we sell our products. In addition, beverage alcohol products are subject to customs duties or excise taxation in many countries, including taxation at the federal, state, and local level in the United States. Laws of each nation define distilling and maturation requirements; for example, under U.S. federal and state regulations, bourbon and Tennessee whiskeys must be aged in new charred oak barrels; we typically age our whiskeys three to six years. Canadian whisky must be manufactured in Canada in compliance with Canadian laws. Mexican authorities regulate the production and bottling of tequilas; they mandate minimum aging periods for extra anejo (three years), anejo (one year), and reposado (two months) tequilas. Irish whiskey must be matured at least three years in a wood cask, such as oak, on the island of Ireland. Scotch whisky must be matured in oak casks for at least three years in Scotland. We comply with all of the above laws and regulations. Our operations are subject to various environmental protection statutes and regulations, and our policy is to comply with them. Eight years ago, we introduced our “Brown-Forman 150” long-term strategy, focused on driving sustainable growth toward our 150th anniversary in 2020. The B-F Arrow articulates our core principles: our purpose as well as the vision, values, and behaviors that we expect our employees to embrace and exhibit. These core principles are a constant, powerful means of connecting our stakeholders to our shared vision of “Building Forever,” and we continue to refresh our strategies to reflect current realities and look beyond 2020. The strategic ambitions described below both demonstrate a sustained focus on several drivers of our recent growth and acknowledge today’s emerging opportunities. We seek to build brands and businesses that create shareholder value – ones that deliver strong and long-term sustainable growth, solid margins, and high returns on invested capital. In addition, given our growing size and scale, we focus on building brands that can be meaningful for our company over time. Our first priority is to innovate and grow our premium spirits portfolio organically. But as opportunities arise, we will consider acquisitions and partnerships that meet our rigorous quantitative and qualitative criteria. The Jack Daniel’s family of brands, led by Jack Daniel’s Tennessee Whiskey (JDTW), remains our most valuable asset and the engine that drives our global leadership of the American whiskey category1 and our overall financial performance. We will always work to keep JDTW strong, healthy, and relevant to consumers worldwide and to take advantage of the abundant opportunities to grow the Jack Daniel’s family of brands across markets, premium price points, channels, and consumer groups. Product innovation has become a meaningful contributor to our performance in recent years. New Jack Daniel’s expressions – Honey (2011), Fire (2015), and Rye (2017) – have led innovation in the American whiskey category. We are the global leader in American whiskey, and see significant opportunities to continue promoting the mixability, versatility, accessibility, and premiumization of our American whiskey brands around the world. We believe that we can leverage our whiskey-making knowledge, production assets, trademarks, and brand-building skills to accomplish this objective. We will focus first on the global growth of our most important expression, JDTW, though with a heightened focus on the super-premium expressions within the trademark – namely, Gentleman Jack, Jack Daniel’s Single Barrel Collection, and Jack Daniel’s Tennessee Rye. In addition, we expect to continue generating excellent growth with our other whiskey brands around the world, particularly Woodford Reserve and Old Forester. We believe Woodford Reserve is the leading super-premium American whiskey globally. Old Forester is regaining its prominence in the United States and in select international markets through its unparalleled taste, quality, and the success of its high-end expressions, such as the Old Forester Whiskey Row Series and Old Forester Statesman. In 2017, we unveiled our Slane Irish Whiskey brand in Ireland, select Travel Retail locations, and in select markets across the United States, the United Kingdom, and Australia. The distillery and homeplace were completed this past year, and we are very encouraged by the brand’s early performance and the accolades the brand, whiskey, and package have received. Through our acquisition of The BenRiach Distillery Company Limited in June 2016, we added three world-class single malt Scotch whisky brands in The GlenDronach, BenRiach, and Glenglassaugh. Following the integration of the acquired business, we have continued to evolve the portfolio and geographic strategy to ensure our single malt portfolio is positioned to become a meaningful contributor and a significant competitor in the fast growing single malt category over the longer term. Here again, we are very encouraged by the trade and consumer reception to the brands and the whisky. Fiscal 2017 marked the ten-year anniversary of our acquisition of Casa Herradura, a portfolio led by two brands steeped in Mexican heritage – Herradura and el Jimador. We remain pleased with the development of our tequila business in both Mexico and the United States, the brands’ two primary markets. We plan to continue expanding Herradura tequila to reach new consumers in Mexico, the United States, and other high-potential markets. In addition to the success of the brand’s core expressions, Herradura Ultra – an ultra-premium cristalino – continues to accelerate and surpassed 70,000 nine-liter cases in fiscal 2018. After repositioning el Jimador tequila as a more premium brand in Mexico, we remain encouraged by our prospects for long-term, profitable growth there. Outside Mexico, we have nearly quadrupled el Jimador’s volumes since fiscal 2008. We remain confident in el Jimador’s potential to improve its position among the world’s leading tequila brands as the category continues to develop rapidly in the United States and to expand (though more gradually) internationally. The United States remains our largest market, and continuing to grow there is important to our long-term success. We expect to foster this growth by emphasizing fast-growing spirits categories such as super-premium whiskeys and tequilas, continued product and packaging innovation, and brand building within growing consumer segments (with increasing emphasis on multicultural marketing). Over the last two decades, our business outside the United States has generally grown faster than our business within it. Fiscal 2018 saw a return to this trend after a few years of suppressed international growth driven by the negative effect of foreign exchange. Our ability to achieve our long-term growth objectives requires further development of our business globally, especially in emerging markets. We expect to continue to grow our business in developed markets such as France, Germany, Australia, and the United Kingdom. We will continue to pursue RTC strategies that will expand our access to and understanding of consumers, with the most recent example being the establishment of our owned distribution organization in Spain, the world’s tenth largest whiskey market,2 during the summer of 2017. In addition, we expect increasingly significant contributions to our growth from emerging markets including Mexico, Poland, Turkey, Brazil, China, Russia, Southeast Asia, Africa, Latin America, and Eastern Europe. We believe that having a long-term-focused, committed, engaged shareholder base, anchored by the Brown family, gives us an important strategic advantage, particularly in a business with aged products and multi-generational brands. For nearly 150 years, the Company and the Brown family have been committed to preserving Brown-Forman as a thriving, family-controlled, independent company. Recognizing the strong cash-generating capacity and the capital efficiency of our business, we will continue to pursue what we believe to be well-balanced capital deployment strategies aimed at perpetuating Brown-Forman’s strength and independence. In pursuing the objectives described above, we will strive to be responsible in everything we do. Our history of responsibility began in 1870, when our founder, George Garvin Brown, first sold whiskey in glass bottles to ensure quality and safety – an innovation some might consider the first act of corporate responsibility in the industry. Today, achieving our stated business purpose, to “enrich the experience of life,” is possible only within a context of corporate responsibility. This means putting our values in action by promoting responsible consumption of alcohol; providing a healthy, safe, inclusive, and engaging workplace; protecting the environment; and making a positive contribution to our communities. Values-Driven Organization. The foundation of our culture is our core values: Integrity, Trust, Respect, Teamwork, and Excellence. Our employee engagement survey responses demonstrate that we not only state these words as our values, but we live them, too. Our values are reflected in our Code of Business Conduct that employees acknowledge and pledge to comply with. Additionally, in the spirit of teamwork, we use our values as one set of criteria when evaluating business partners. Alcohol Responsibility. Our business is based on the belief that beverage alcohol, consumed in moderation, can enrich the experience of life. However, we are well aware that, when consumed irresponsibly, alcohol can have harmful effects on individuals and society. We appreciate the need for governments to regulate our industry appropriately and effectively, taking into account national circumstances and local cultures. We also appreciate that some people should not drink or choose not to drink, and we respect this choice. Acting in partnership with others, we want to be part of the solution to real, complex problems such as underage drinking, drunk driving, overconsumption, and alcoholism. As a significant player in the global beverage alcohol industry, we foster collective action with our peers. Working with other producers, we are able to leverage our views on a scale that can create change. In 2017, we concluded our five-year program with 10 other industry leaders that signed the Beer, Wine, and Spirits Producers’ Commitments to Reduce Harmful Drinking. Our collective progress on these commitments will be reported later in 2018 and can be seen at www.producerscommitments.org. Since 2009, we have hosted an open forum to share our points of view, post the research of outside experts, and encourage the opinions of others at www.OurThinkingAboutDrinking.com. In the past year, we have added information from contributors on a variety of alcohol-related subjects, including addiction and pregnancy, moderate consumption, and alcohol and aggression. In 2017, Korbel partnered with the Dryver designated driver service to provide more than 2,000 free designated drivers in 77 cities nationwide. In Poland we partnered with Carrefour, a large retailer chain, to deliver key responsibility messages to consumers across 90 of their stores. For the fourth consecutive year, the New Hampshire (NH) Liquor Commission and Jack Daniel’s teamed up for the award-winning Live Free & Host Responsibly campaign. Since its launch in 2015, the campaign has reached thousands of NH Liquor & Wine Outlet customers, promoting responsible service and consumption of alcohol. This first-of-its-kind collaboration between a control state and a beverage alcohol company has become a model for the industry, gaining widespread attention and industry praise. We also continued to collaborate with the Responsible Retailing Forum, which brings together diverse stakeholders seeking to reduce underage sales, among other initiatives. In our consumer relationships, we seek to communicate through responsible advertising content and placement, relying on our comprehensive internal marketing code and adhering to industry marketing and advertising guidelines. We also engage with our customers through our trade associations. For example, we worked with Avec Modération in France to engage convenience stores on underage drinking prevention. As part of our commitment to responsible marketing, and to enable consumers to make more informed decisions, in February 2017 we launched a website, nutrition.brown-forman.com, providing nutritional information on our brands. Since then, we have added three additional markets and languages to the site, with plans to add four more in the coming year. We are founding members of, and contribute significant resources to, the Foundation for Advancing Alcohol Responsibility (responsibility.org), an organization created by spirits producers to prevent drunk driving and underage drinking and to promote responsible decision making. While this is a U.S. organization, we participate actively in similar organizations in other markets, such as DrinkWise in Australia, BSI in Germany, The Portman Group in the United Kingdom, and FISAC in Mexico. We also provide long-running support for alcohol education programs at the University of Louisville and the University of Kentucky (two major universities in the state of our corporate headquarters). In addition, through our corporate charitable contributions, we support organizations that offer treatment and recovery for those struggling with alcoholism and addiction. Our three anchor partners in Louisville, Kentucky, are The Healing Place, The Morton Center, and Volunteers of America Mid-States. In addition to our financial contributions, we support these organizations by having Brown-Forman employees serve on their boards of directors. Environmental Sustainability. We view environmental sustainability as integral to our strategy to perpetuate Brown-Forman and “Build Forever.” Our environmental sustainability strategy aims to protect and conserve the resources we depend on. It also reinforces our business strategy through programs that reduce costs through efficiency, lessen risks to our operations, and improve effectiveness through innovation. We invest in renewable energy, energy efficiency, and efficient transportation to reduce our carbon footprint. In 2018, we executed a 15-year power purchase agreement for environmental attributes associated with the energy output from a wind farm facility located in Kansas. The wind farm is expected to generate the equivalent of more than 90% of Brown-Forman’s annual electricity use in the United States. Mindful of our overall impact, in fiscal 2014, we set ambitious environmental sustainability goals for fiscal 2023: reducing our absolute greenhouse gas emissions by 15% and reducing our water use and wastewater discharges per unit of product by 30% (compared to metrics in 2012). In addition, we set a goal of sending zero waste to landfills by 2020. These goals support our ambition to grow our brands and our company responsibly while protecting and enriching the natural environment. We have refreshed our strategy to include a greater focus beyond our operational borders into our supply chain. We report on our progress toward these goals in our biennial Corporate Responsibility Reports, available on our corporate website. the eighth consecutive year. Our Employee Resource Groups (ERGs) have been the core of our diversity culture by supporting employees’ growth while enhancing their contributions. Our eight ERGs foster a diverse, inclusive environment that drives our high-commitment, high-performance organization and encourages our employees to bring their individuality to work. Our commitment to diversity extends to our partnerships with small and diverse suppliers. By 2020, our goal is to source at least 16% of our procurement from businesses owned by ethnic minorities, women, LGBTQ persons, people with disabilities, and veterans. To date, we have procured approximately 11% of our supplies from such businesses. In the marketplace, we focus on promoting fair, ethical business practices. We remain committed to the guidelines set forth in our Global Human Rights Statement, defining our commitment to respecting the fundamental rights of all human beings. Our work in this area helped inform our response to the U.K.’s passage of the Modern Slavery Act in 2015, which is available on our corporate website. Community Involvement. Our approach to philanthropy reflects our values as a corporate citizen. Brown-Forman believes, as a responsible and caring corporate citizen, it is vital that we give back to the communities that support both our employees and our business by thoughtfully deploying our time, talent, and resources. We collaborate with a variety of mission-driven organizations focused on enhancing intellectual and cultural living, ensuring essential living standards, and empowering responsible and sustainable living. While we focus on our hometown of Louisville, Kentucky, our civic engagement activities extend to the communities around the globe where our employees work, live, and raise their families. In fiscal 2018, we donated approximately $11 million, logged approximately 17,000 volunteer hours, and had 123 employees serve on boards of directors of 196 non-profit organizations. In addition, with the goal of helping fund our ongoing philanthropic endeavors in the communities where our employees live and work, we created the Brown-Forman Foundation with a contribution of $70 million in fiscal 2018. We anticipate that the Brown-Forman Foundation’s proceeds will provide a consistent amount of revenue per year for its charitable giving program independent of our yearly earnings. United Nations Sustainable Development Goals. We reviewed our corporate responsibility strategy against the United Nations Sustainable Development Goals, a set of 17 global goals designed to address a broad range of sustainable development issues from climate change to poverty and gender equality. Our review on where our work aligns with these goals is available in our 2017-2018 Corporate Responsibility Report (www.brown-forman.com/responsibility). As of April 30, 2018, we employed approximately 4,800 people worldwide (2,700 in the United States), including about 230 employed on a part-time or temporary basis. Approximately 14% of our employees are represented by a union. We believe our employee relations are good. Company Chairman and Chief Executive Officer since 2007. Chief Executive Officer since 2005. On May 29, 2018, we announced Paul C. Varga’s decision to retire, effective December 31, 2018. The Board of Directors unanimously approved Lawson E. Whiting to succeed Mr. Varga as Chief Executive Officer, effective January 1, 2019. Mr. Varga will remain on the Board of Directors of the Company and is expected to stand for re-election at the upcoming Annual Meeting of Stockholders to be held on July 26, 2018. Executive Vice President and Chief Financial Officer since 2014. Senior Vice President, Chief Production Officer, and Head of Information Technology from 2013 to 2014. Senior Vice President and Director of Financial Management, Accounting, and Technology from 2008 to 2013. Executive Vice President, General Counsel, and Secretary since 2007. Executive Vice President and Chief Brands Officer since June 2018. Executive Vice President and President of Jack Daniel’s Brands from February 2015 to June 2018. Executive Vice President and President for Europe, Africa, Middle East, Asia Pacific, and Travel Retail from 2013 to 2015. Executive Vice President and Chief Operating Officer from 2009 to 2013. Executive Vice President and Chief Brands Officer from 2006 to 2009. Executive Vice President and Chief Operating Officer since October 2017. Executive Vice President and Chief Brands and Strategy Officer from February 2015 to September 2017. Senior Vice President and Chief Brands Officer from 2013 to 2015. Senior Vice President and Managing Director for Western Europe from 2011 to 2013. Vice President and Finance Director for Western Europe from 2010 to 2011. Vice President and Finance Director for North America from 2009 to 2010. On May 29, 2018, we announced that the Board of Directors unanimously approved Lawson E. Whiting to succeed Paul C. Varga as Chief Executive Officer, effective January 1, 2019. Senior Vice President and Chief Production Officer since 2014. Vice President and General Manager for Brown-Forman Tequila Mexico Operations from 2008 to 2014. Senior Vice President and Chief Diversity Officer since 2007. Senior Vice President and Chief Accounting Officer since 2013. Vice President and Finance Director for Greater Europe and Africa from 2009 to 2013. Senior Vice President and Chief Human Resources Officer since February 2015. Senior Vice President and Director of HR Business Partnerships from 2013 to 2015. Vice President and Director of Organization and Leader Development 2011 to 2013. Assistant Vice President and Director of Employee Engagement from 2009 to 2011. Senior Vice President, President U.S.A. and Canada since June 2018. Senior Vice President, Chief Marketing Officer of B-F Brands from February 2015 to June 2018. Senior Vice President, Managing Director Jack Daniel’s from 2011 to 2015. Senior Vice President, Managing Director Herradura from 2007 to 2011. Senior Vice President, International Division since June 2018. Senior Vice President and President for Europe, North Asia, and ANZSEA from February 2015 to June 2018. Senior Vice President and Managing Director for Europe from 2013 to 2015. Senior Vice President and Managing Director for Greater Europe and Africa from 2006 to 2013. Senior Vice President, Chief Corporate Affairs Officer since June 2018. Senior Vice President, North America Region from May 2009 to June 2018. Senior Vice President, Chief of Staff, and Director of Global Corporate Communications and Services since February 2015. Senior Vice President and Chief Human Resources Officer from 2009 to 2015. Senior Vice President and Director of Global Human Resources from 2007 to 2009. You can read and copy any materials that we file with the SEC in its Public Reference Room at 100 F Street, NE, Washington, D.C. 20549. Information on the Public Reference Room may be obtained by calling the SEC at 1-800-SEC-0330. In addition, the SEC maintains a website that contains reports, proxy and information statements, and other information regarding issuers that file with the SEC at www.sec.gov. Our website address is www.brown-forman.com. Our annual reports on Form 10-K, quarterly reports on Form 10-Q, current reports on Form 8-K, and any amendments to these reports are available free of charge on our website as soon as reasonably practicable after we electronically file those reports with the SEC. The information provided on our website is not part of this report, and is therefore not incorporated by reference, unless that information is otherwise specifically referenced elsewhere in this report. On our website, we have posted our Code of Conduct that applies to all our directors and employees, and our Code of Ethics that applies specifically to our senior financial officers. If we amend or waive any of the provisions of our Code of Conduct or our Code of Ethics applicable to our principal executive officer, principal financial officer, or principal accounting officer that relates to any element of the definition of “code of ethics” enumerated in Item 406(b) of Regulation S-K under the Securities Act of 1934 Act, we intend to disclose these actions on our website. We have also posted on our website our Corporate Governance Guidelines and the charters of our Audit Committee, Compensation Committee, Corporate Governance and Nominating Committee, and Executive Committee of our Board of Directors. Copies of these materials are also available free of charge by writing to our Secretary, Matthew E. Hamel, 850 Dixie Highway, Louisville, Kentucky 40210 or emailing him at Secretary@b-f.com. We believe the following discussion identifies the most significant risks and uncertainties that could adversely affect our business. If any of the following risks were actually to occur, our business, results of operations, cash flows, or financial condition could be materially and adversely affected. Additional risks not currently known to us, or that we currently deem to be immaterial, could also materially and adversely affect our business, results of operations, cash flows, or financial condition. Unfavorable economic conditions could negatively affect our operations and results. Unfavorable global or regional economic conditions, including uncertainty caused by unstable geopolitical environments in many parts of the world, could adversely affect our business and financial results. While the major economic disruptions of the most recent financial crisis have largely subsided, many markets where our products are sold still face significant economic challenges resulting from the global economic downturn that followed, including low consumer confidence, high unemployment, budget deficits, burdensome governmental debt, austerity measures, increased taxes, and weak financial, credit, and housing markets. Unfavorable economic conditions such as these can cause governments to increase taxes on beverage alcohol to attempt to raise revenue, reducing consumers’ willingness to make discretionary purchases of beverage alcohol products or pay for premium brands such as ours. In unfavorable economic conditions, consumers may make more value-driven and price-sensitive purchasing choices and drink more at home rather than at restaurants, bars, and hotels, which tend to favor many of our premium and super-premium products. Our global business is subject to commercial, political, and financial risks, including foreign currency exchange rate fluctuations. Our products are sold in more than 170 countries; accordingly, we are subject to risks associated with doing business globally, including commercial, political, and financial risks. In the long term, we continue to expect our growth rates in emerging markets, such as eastern Europe, Latin America, Asia, and Africa, to surpass our growth rates in the United States and more developed markets, such as the United Kingdom, France, Germany, and Australia. However, we still expect our international developed markets to provide growth opportunities for us. If shipments of our products – particularly Jack Daniel’s Tennessee Whiskey – to our global markets were to experience significant disruption due to these risks or for other reasons, it could have a material adverse effect on our financial results. For example, Russia has enacted legislation that empowers its president to implement a partial or total ban on the importation of goods and products from and produced by companies under the jurisdiction of the United States and other “unfriendly” foreign countries. If such legislation were to be implemented, the sale of our products in Russia, especially Jack Daniel’s Tennessee Whiskey, could be significantly and adversely affected. In addition, we are subject to potential business disruption caused by military conflicts; potentially unstable governments or legal systems; civil or political upheaval or unrest; local labor policies and conditions; possible expropriation, nationalization, or confiscation of assets; problems with repatriation of foreign earnings; economic or trade sanctions; closure of markets to imports; anti-American sentiment; terrorism or other types of violence in or outside the United States; health pandemics; and a significant reduction in global travel. For example, the United States recently imposed tariffs on steel and aluminum. In response, Mexico has imposed retaliatory tariffs on U.S. imports, including our American whiskey products. The European Union and several other countries have threatened to follow suit. If implemented, these tariffs could increase the price of our products in these countries and could prompt consumers to seek alternative products. Furthermore, uncertainty related to the future of the European Union may affect our business and financial performance in Europe. For instance, in June 2016, the United Kingdom voted by referendum to leave the European Union (Brexit), and, until the United Kingdom’s exit from the European Union is finalized, there may be a period of economic and political uncertainty related to the negotiation of any successor trading arrangement with other countries as well as volatility in exchange rates, risk to supply chains across the European Union, restrictions on the mobility of employees and consumers, or changes to customs duties, tariffs, or industry specific requirements and regulations. In addition, any new trade barriers, sanctions, tariffs, or any retaliatory measures in response to the foregoing could materially and adversely affect our operations. Our success will depend, in part, on our ability to overcome the challenges we encounter with respect to these risks and other factors affecting U.S. companies with global operations. National and local governments may adopt regulations or undertake investigations that could limit our business activities or increase our costs. Our business is subject to extensive regulatory requirements regarding production, exportation, importation, marketing and promotion, labeling, distribution, pricing, and trade practices, among others. Changes in laws, regulatory measures, or governmental policies, or the manner in which current ones are interpreted, could cause us to incur material additional costs or liabilities, and jeopardize the growth of our business in the affected market. Specifically, governments may prohibit, impose, or increase limitations on advertising and promotional activities, or times or locations where beverage alcohol may be sold or consumed, or adopt other measures that could limit our opportunities to reach consumers or sell our products. Certain countries historically have banned all television, newspaper, magazine, and internet advertising for beverage alcohol products. Increases in regulation of this nature could substantially reduce consumer awareness of our products in the affected markets and make the introduction of new products more challenging. Some countries where we do business have a higher risk of corruption than others. While we are committed to doing business in accordance with applicable anti-corruption and other laws, our Code of Conduct, Code of Ethics for Senior Financial Officers, and our other policies, we remain subject to the risk that an employee will violate our policies, or that any of our many affiliates or agents, such as importers, wholesalers, distributors, or other business partners, may take action determined to be in violation of international trade, money laundering, anti-corruption, or other laws, including the U.S. Foreign Corrupt Practices Act of 1977, the U.K. Bribery Act 2010, or equivalent local laws. Any determination that our operations or activities are not, or were not, in compliance with U.S. or foreign laws or regulations could result in investigations, interruption of business, loss of business partner relationships, suspension or termination of licenses and permits (our own or those of our partners), imposition of fines, legal or equitable sanctions, negative publicity, and management distraction. Further, our compliance with applicable anti-corruption or other laws, our Code of Conduct, Code of Ethics for Senior Financial Officers, and our other policies could result in higher operating costs. Additional regulation in the United States and other countries addressing climate change, use of water, and other environmental issues could increase our operating costs. Increasing regulation of fuel emissions could increase the cost of energy, including fuel, required to operate our facilities or transport and distribute our products, thereby substantially increasing the production, distribution, and supply chain costs associated with our products. Tax increases and changes in tax rules could adversely affect our financial results. Our business is sensitive to changes in both direct and indirect taxes. As a multinational company based in the United States, we are more exposed to the impact of U.S. tax changes than some of our major competitors, especially those that affect the effective corporate income tax rate. On December 22, 2017, the U.S. government enacted comprehensive tax legislation commonly referred to as the Tax Cuts and Jobs Act (Tax Act). The Tax Act significantly revises the U.S. corporate income tax by, among other things, lowering U.S. corporate income tax rates and implementing a territorial tax system. Shortly after the Tax Act was enacted, the U.S. Securities and Exchange Commission issued Staff Accounting Bulletin No. 118, Income Tax Accounting Implications of the Tax Cuts and Jobs Act (SAB 118) to address the application of GAAP. SAB 118 directs taxpayers to consider the impact of the Tax Act as provisional when a company does not have the necessary information available, prepared, or analyzed (including computations) in reasonable detail to complete the accounting for the change in tax law. In accordance with SAB 118, we have recognized the provisional tax impacts related to the repatriation tax and the re-measurement of deferred tax assets and liabilities. However, many aspects of the Tax Act are still unclear and may not be clarified for some time. Ultimately, the actual impact of the Tax Act may differ from our provisional estimates, possibly materially, due to, among other things, the significant complexity of the Tax Act, anticipated additional regulatory guidance, or related interpretations that may be issued by the Internal Revenue Service, changes in accounting standards, legislative actions, future actions by states within the U.S. and changes in estimates, analyses, interpretations, and assumptions we have made. New tax rules, accounting standards, or pronouncements, and changes in interpretation of existing rules, standards, or pronouncements could also have a significant adverse effect on our business and financial results. This includes potential changes in tax rules or the interpretation of tax rules arising out of the Base Erosion & Profit Shifting project initiated by the Organization for Economic Co-operation and Development, as well as changes in the interpretation of tax rules arising out of the European Union State Aid investigations. Our business operations are also subject to numerous duties or taxes that are not based on income, sometimes referred to as “indirect taxes.” These indirect taxes include excise taxes, sales or value-added taxes, property taxes, payroll taxes, import and export duties, and tariffs. Increases in or the imposition of new indirect taxes on our operations or products would increase the cost of our products or, to the extent levied directly on consumers, make our products less affordable, which could negatively affect our financial results by reducing purchases of our products and encouraging consumers to switch to lower-priced or lower-taxed product categories. As governmental entities look for increased sources of revenue, they may increase taxes on beverage alcohol products. For example, in 2017, the United Kingdom increased its tax on beer, cider, wine, and spirits by 3.9%, providing a potential source of revenue to fund its post-Brexit obligations. In 2018, we have observed excise tax increases in Australia, France, and Turkey. In addition to indirect taxes, our global business can also be negatively affected by trade barriers and other governmental protectionist measures, any of which can be imposed suddenly and unpredictably. Recently, retaliatory tariffs have been imposed by Mexico and threatened by the European Union, Canada, Russia, China, and several other countries following the imposition of tariffs on steel and aluminum by the United States. Mexico’s new tariffs on bourbon, and tariffs typically, take the form of value-added levies on U.S.-sourced products. As an example, a tariff on American whiskey would result in either reduced margins or increased consumer prices, either of which could adversely impact our financial results and demand for our products. Our business performance is substantially dependent upon the continued health of the Jack Daniel’s family of brands. Changes in consumer preferences and purchases, and our ability to anticipate or react to them, could negatively affect our business results. We are a branded consumer products company in a highly competitive market, and our success depends substantially on our continued ability to offer consumers appealing, high-quality products. Consumer preferences and purchases may shift, often in unpredictable ways, due to a host of factors, including changes in economic conditions, demographic, and social trends; public health policies and initiatives; changes in government regulation of beverage alcohol products; concerns or regulations related to product safety; legalization of marijuana use on a more widespread basis within the United States, Canada, or elsewhere; and changes in travel, leisure, dining, gifting, entertaining, and beverage consumption trends. Consumers may begin to shift their consumption and purchases of our premium and super-premium products, more commonly found in on-premise establishments, in favor of off-premise purchases or away from alcoholic beverages entirely. This includes consumption at home as a result of various factors, including shifts in social trends, proliferation of smoking bans, and stricter laws relating to driving while under the influence of alcohol, as well as shifts to purchases of our products to e-commerce retailers. Shifts in consumption and purchasing channels such as these could adversely impact our profitability. Consumers also may begin to prefer the products of competitors or may generally reduce their demand for brands produced by larger companies. Over the past several years, the number of small, local distilleries in the United States has grown significantly. This is being driven by a trend of consumers showing increasing interest in locally produced, regionally sourced products. As many more competitive brands enter the market, it could have a negative impact on the demand for our premium and super-premium American whiskey brands, including Jack Daniel’s. In addition, we could experience unfavorable business results if we fail to attract consumers from diverse backgrounds and ethnicities in the United States and in our non-U.S. markets. Demographic forecasts in the United States for the next couple of years after 2018 indicate a slight decrease in the population segment aged 21 to 24; fewer potential consumers in this age bracket could have a negative effect on industry growth rates and on our business. To continue to succeed, we must anticipate or react effectively to shifts in demographics, consumer behavior, consumer preferences, drinking tastes, and drinking occasions. Our plans call for the continued growth of the Jack Daniel’s family of brands. In particular, we plan to continue to grow Jack Daniel’s Tennessee Honey sales globally and to further expand our launch of Jack Daniel’s Tennessee Rye in additional international markets such as the United Kingdom, France, Germany, and Canada in fiscal 2019. If these plans do not succeed, or if we otherwise fail to develop or implement effective business, portfolio, and brand strategies, our growth, stock price, or financial results could suffer. More broadly, if consumers shift away from spirits (particularly brown spirits such as American whiskey and bourbon), our premium-priced brands, or our RTD products, our financial results could be adversely affected. We believe that new products, line extensions, label and bottle changes, product reformulations, and similar product innovations by both our competitors and us will compete increasingly for consumer drinking occasions. Product innovation, such as our launch of Jack Daniel’s Tennessee Rye, is a significant element of our growth strategy; however, there can be no assurance that we will continue to develop and implement successful line extensions, packaging, formulation or flavor changes, or new products. Unsuccessful implementation or short-lived popularity of our product innovations could result in inventory write-offs and other costs, reduction in profits from one year to the next, and also could damage consumers’ perception of the brand family. Our inability to attract consumers to our product innovations relative to our competitors’ products – especially over time – could negatively affect our growth, business, and financial results. Production facility disruption could adversely affect our business. Some of our largest brands, including Jack Daniel’s, Finlandia Vodka, and our tequilas, are distilled at single locations. A catastrophic event causing physical damage, disruption, or failure at any one of our major distillation or bottling facilities, including facilities that support the production of our premium brands such as Woodford Reserve and Old Forester, could adversely affect our business. Further, because whiskeys and some tequilas are aged for various periods, we maintain a substantial inventory of aged and maturing products in warehouses at a number of different sites. The loss of a substantial amount of aged inventory – through fire, other natural or man-made disaster, contamination, or otherwise – could significantly reduce the supply of the affected product or products. A consequence of any of these or other supply or supply chain disruptions could prevent us from meeting consumer demand for the affected products for a period of time. In addition, insurance proceeds may be insufficient to cover the replacement value of our inventory of maturing products and other assets if they were to be lost. Disaster recovery plans may not prevent business disruption, and reconstruction of any damaged facilities could require a significant amount of time. The inherent uncertainty in supply/demand forecasting could adversely affect our business, particularly with respect to our aged products. Glenglassaugh Scotch whisky brands and distilleries introduce a new category of inventory, which require long-term maturation of 30 years or more, making forecasts of demand for such products in future periods subject to significant uncertainty. Factors that affect our ability to forecast accurately include changes in business strategy, market demand, consumer preferences, macroeconomic conditions, introductions of competing products, and other changes in market conditions. Any forecasting error could lead to our inability to meet the objectives of our business strategy, failure to meet future demand, or lead to a future surplus of inventory and consequent write-down in value of maturing stocks. If we are unable to accurately forecast demand for our products or efficiently manage inventory, this may have a material adverse effect on our business and financial results. Further, we cannot be certain that we will be successful in using various levers, such as pricing changes, to create the desired balance of available supply and consumer demand for particular years or products. As a consequence, we may be unable to meet consumer demand for the affected products for a period of time. Furthermore, not having our products in the market on a consistent basis may adversely affect our brand equity and future sales. Higher costs or unavailability of materials could adversely affect our financial results, as could our inability to obtain certain finished goods or to sell used materials. Our products use materials and ingredients that we purchase from suppliers. Our ability to make and sell our products depends upon the availability of the raw materials, product ingredients, finished products, wood, glass and PET bottles, cans, bottle closures, packaging, and other materials used to produce and package them. Without sufficient quantities of one or more key materials, our business and financial results could suffer. For instance, only a few glass producers make bottles on a scale sufficient for our requirements, and a single producer supplies most of our glass requirements. In addition, if we were to experience a disruption in the supply of American oak logs to produce the new charred oak barrels in which we age our whiskeys, our production capabilities would be compromised. If any of our key suppliers were no longer able to meet our timing, quality, or capacity requirements, ceased doing business with us, or significantly raised prices, and we could not promptly develop alternative cost-effective sources of supply or production, our operations and financial results could suffer. Higher costs or insufficient availability of suitable grain, agave, water, grapes, wood, glass, closures, and other input materials, or higher associated labor costs or insufficient availability of labor, may adversely affect our financial results because we may not be able to pass along such cost increases or the cost of such shortages through higher prices to customers without reducing demand or sales. Similarly, when energy costs rise, our transportation, freight, and other operating costs, such as distilling and bottling expenses, also may increase. Our freight cost and the timely delivery of our products could be adversely impacted by a number of factors which could reduce the profitability of our operations, including driver shortages, higher fuel costs, weather conditions, traffic congestion, increased government regulation, and other matters. Our financial results may be adversely affected if we are not able to pass along energy and freight cost increases through higher prices to our customers without reducing demand or sales. International or domestic geopolitical or other events, including the imposition of any tariffs or quotas by governmental authorities on any raw materials that we use in the production of our products, could adversely impact the supply and cost of these raw materials to us. If we cannot offset higher raw material costs with higher selling prices, increased sales volume, or reductions in other costs, our profitability could be adversely affected. Weather, the effects of climate change, fires, diseases, and other agricultural uncertainties that affect the mortality, health, yield, quality, or price of the various raw materials used in our products also present risks for our business, including in some cases potential impairment in the recorded value of our inventory. Changes in weather patterns or intensity can disrupt our supply chain as well, which may affect production operations, insurance costs and coverage, and the timely delivery of our products. Water is an essential component of our products, so the quality and quantity of available water is important to our ability to operate our business. If droughts become more common or severe, or if our water supply were interrupted for other reasons, high-quality water could become scarce in some key production regions for our products, including Tennessee, Kentucky, California, Finland, Canada, Mexico, Scotland, and Ireland. Our ability to sell used materials for reuse may be affected by fluctuations in the market. For example, weaker demand from blended Scotch industry buyers, lower prices, and increased supply of used barrels may make it difficult to sell our used barrels at sustainable prices and quantities which could negatively affect our financial results. If the social acceptability of our products declines, or governments adopt policies disadvantageous to beverage alcohol, our business could be adversely affected. excessive levels or inappropriate patterns of drinking can lead to increased risk of a range of health conditions and, for certain people, can result in alcohol dependence. Some academics, public health officials, and critics of the alcohol industry in the United States, Europe, and other parts of the world continue to seek governmental measures to make beverage alcohol more expensive, less available, or more difficult to advertise and promote. Furthermore, health and wellness trends over the past several years may result in a shift in consumer preferences away from alcoholic beverages. If future scientific research indicated more widespread serious health risks associated with alcohol consumption – particularly with moderate consumption – or if for any reason the social acceptability of beverage alcohol were to decline significantly, sales of our products could decrease. Significant additional labeling or warning requirements or limitations on the availability of our products could inhibit sales of affected products. Various jurisdictions have adopted or may seek to adopt significant additional product labeling or warning requirements or limitations on the availability of our products relating to the content or perceived adverse health consequences of some of our products. Several such labeling regulations or laws require warnings on any product with substances that the state lists as potentially associated with cancer or birth defects. Our products already raise health and safety concerns for some regulators, and heightened requirements could be imposed. If additional or more severe requirements of this type are imposed on one or more of our major products under current or future health, environmental, or other laws or regulations, they could inhibit sales of such products. Further, we cannot predict whether our products will become subject to increased rules and regulations which, if enacted, could increase our costs or adversely impact sales. For example, studies have been conducted in Australia and the United Kingdom to consider the impact of requiring the sale of alcohol in plain packaging with more comprehensive health warnings in an effort to change drinking habits in those countries. These studies could result in additional governmental regulations concerning the production, marketing, labeling, or availability of our products, any of which could damage our reputation, making our premium brands unrecognizable, or reduce demand of our products, which could adversely affect our profitability. We face substantial competition in our industry, including many new entrants into spirits; and consolidation among beverage alcohol producers, wholesalers, and retailers, or changes to our route-to-consumer model, could hinder the marketing, sale, or distribution of our products. We use different business models to market and distribute our products in different countries around the world. In the United States, we sell our products either to distributors for resale to retail outlets or e-commerce retailers, in those states that control alcohol sales, to state governments who then sell them to retail customers and consumers. In our non-U.S. markets, we use a variety of route-to-consumer models – including, in many markets, reliance on others to market and sell our products. Consolidation among spirits producers, distributors, wholesalers, suppliers, or retailers and the increased growth and popularity of the e-commerce retail environment across the consumer product goods market could create a more challenging competitive landscape for our products. Consolidation at any level could hinder the distribution and sale of our products as a result of reduced attention and resources allocated to our brands both during and after transition periods, because our brands might represent a smaller portion of the new business portfolio. Furthermore, consolidation of distributors may lead to the erosion of margins as newly consolidated distributors take down prices. Changes in distributors’ strategies, including a reduction in the number of brands they carry, the allocation of shelf space for our competitors’ brands, or private label products, may adversely affect our sales, margin, outlook, and market share. Expansion into new product categories by other suppliers, or innovation by new entrants into the market, could increase competition in our product categories. For example, we are experiencing increased competition for some of our products from new entrants in the small-batch or craft spirits category. Changes to our route-to-consumer models or partners in important markets could result in temporary or longer-term sales disruption, could result in higher costs, and could negatively affect other business relationships we might have with that partner. Disruption of our distribution network or fluctuations in our product inventory levels at distributors, wholesalers, or retailers could negatively affect our results for a particular period. Further, while we believe we have sufficient scale to succeed relative to our major competitors, we nevertheless face a risk that continuing consolidation of large beverage alcohol companies could put us at a competitive disadvantage. Our competitors may respond to industry and economic conditions more rapidly or effectively than we do. For example, we are facing an increasingly competitive pricing environment, and our competitors may have more flexibility to adjust to such challenges. Other suppliers, as well as wholesalers and retailers of our brands, offer products that compete directly with ours for shelf space, promotional displays, and consumer purchases. Pricing (including price promotions, discounting, couponing, and free goods), marketing, new product introductions, entry into our distribution networks, and other competitive behavior by other suppliers, and by wholesalers and traditional and e-commerce retailers, could adversely affect our sales, margins, and business and financial results. While we seek to take advantage of the efficiencies and opportunities that large retail customers can offer, they often seek lower pricing and purchase volume flexibility, offer competing own-label products, and represent a large number of other competing products. If the buying power of these large retail customers continues to increase, it could negatively affect our financial results. We might not succeed in our strategies for acquisitions and dispositions. From time to time, we acquire or invest in additional brands or businesses. We expect to continue to seek acquisition and investment opportunities that we believe will increase long-term shareholder value, but we may not be able to find and purchase brands or businesses at acceptable prices and terms. Acquisitions involve risks and uncertainties, including potential difficulties integrating acquired brands and personnel; the possible loss of key customers or employees most knowledgeable about the acquired business; implementing and maintaining consistent U.S. public company standards, controls, procedures, policies, and information systems; exposure to unknown liabilities; business disruption; and management distraction. Acquisitions, investments, or joint ventures could also lead us to incur additional debt and related interest expenses, issue additional shares, become exposed to contingent liabilities, and lead to dilution in our earnings per share and reduction in our return on average invested capital. We could incur future restructuring charges or record impairment losses on the value of goodwill or other intangible assets resulting from previous acquisitions, which may also negatively affect our financial results. We also evaluate from time to time the potential disposition of assets or businesses that may no longer meet our growth, return, or strategic objectives. In selling assets or businesses, we may not get prices or terms as favorable as we anticipated. We could also encounter difficulty in finding buyers on acceptable terms in a timely manner, which could delay our accomplishment of strategic objectives. Expected cost savings from reduced overhead relating to the sold assets may not materialize, and the overhead reductions could temporarily disrupt our other business operations. Any of these outcomes could negatively affect our financial results. Counterfeiting or inadequate protection of our intellectual property rights could adversely affect our business prospects. Our brand names, trademarks, and related intellectual property rights are critical assets, and our business depends on our protecting them online and in the countries where we do business. We may not succeed in protecting our intellectual property rights in a given market or in challenging those who infringe our rights or imitate or counterfeit our products. Although we believe that our intellectual property rights are legally protected in the markets where we do business, the ability to register and enforce intellectual property rights varies from country to country. In some countries, for example, it may be more difficult to successfully stop counterfeiting or look-alike products, either because the law is inadequate or, even though satisfactory legal options may exist, it may be difficult to obtain and enforce sanctions against counterfeiters. We may not be able to register our trademarks in every country where we want to sell a particular product, and we may not obtain favorable decisions by courts or trademark offices. Many global spirits brands, including some of our brands, experience problems with product counterfeiting and other forms of trademark infringement. We combat counterfeiting by working with other companies in the spirits industry through our membership in the International Federation of Spirits Producers (IFSP) and with brand owners in other industries via our membership in React, an anti-counterfeiting network organization. While we believe IFSP and React are effective organizations, they are not active in every market, and their efforts are subject to obtaining the cooperation of local authorities and courts in the markets where they are active. Despite the efforts of IFSP, React, and our own teams, lower-quality and counterfeit products that could be harmful to consumers could reach the market and adversely affect our intellectual property rights, brand equity, corporate reputation, and financial results. In addition, the industry as a whole could suffer negative effects related to the manufacture, sale, and consumption of illegally produced beverage alcohol. Product recalls or other product liability claims could materially and adversely affect our sales. The success of our brands depends upon the positive image that consumers have of those brands. We could decide to, or be required to, recall products due to suspected or confirmed product contamination, product tampering, spoilage, or other quality issues. Any of these events could adversely affect our sales. Actual contamination, whether deliberate or accidental, could lead to inferior product quality and even illness, injury, or death to consumers, potential liability claims, and material loss. Should a product recall become necessary, or we voluntarily recall a product in the event of contamination, damage, or other quality issue, sales of the affected product or our broader portfolio of brands could be adversely affected. A significant product liability judgment or widespread product recall may negatively impact sales and business and financial results of the affected brand or brands. Even if a product liability claim is unsuccessful or is not fully pursued, resulting negative publicity could adversely affect our reputation with existing and potential customers and our corporate and brand image. Litigation and legal disputes could expose our business to financial and reputational risk. lawsuits have been largely unsuccessful in the past, others may succeed in the future. We could also experience employment-related class actions, environmental claims, commercial disputes, product liability actions stemming from a beverage or container production defect, a whistleblower suit, or other major litigation that could adversely affect our business results, particularly if there is negative publicity or to the extent the losses or expenses were not covered by insurance. Governmental actions around the world to enforce trade practice, anti-money-laundering, anti-corruption, competition, tax, environmental, and other laws are also a continuing compliance risk for global companies such as ours. In addition, as a U.S. public company, we are exposed to the risk of securities-related class action suits, particularly following a precipitous drop in the share price of our stock. Adverse developments in major lawsuits concerning these or other matters could result in management distraction and have a material adverse effect on our business. A cyber breach or a failure or corruption of one or more of our key information technology systems, networks, processes, associated sites, or service providers could have a material adverse impact on our business. We rely on information technology (IT) systems, networks, and services, including internet sites, data hosting and processing facilities and tools, hardware (including laptops and mobile devices), software, and technical applications and platforms, some of which are managed, hosted, provided, or used by third parties or their vendors, to help us manage our business. The various uses of these IT systems, networks, and services include, but are not limited to: hosting our internal network and communication systems; ordering and managing materials from suppliers; supply/demand planning; production; shipping products to customers; hosting corporate strategic plans and employee data; hosting our branded websites and marketing products to consumers; collecting and storing customer, consumer, employee, investor, and other data; processing transactions; summarizing and reporting results of operations; hosting, processing, and sharing confidential and proprietary research, business plans, and financial information; complying with regulatory, legal, or tax requirements; providing data security; and handling other processes necessary to manage our business. Increased IT security threats and more sophisticated cyber crimes and cyber attacks pose a potential risk to the security and availability of our IT systems, networks, and services, including those that are managed, hosted, provided, or used by third parties, as well as the confidentiality, availability, and integrity of our data and the data of our customers, consumers, employees, and others. If the IT systems, networks, or service providers we rely upon fail to function properly, or if we suffer a loss or disclosure of our business strategy or other sensitive information, due to any number of causes, ranging from catastrophic events to power outages to security breaches to usage errors by employees and other security issues, we may suffer interruptions in our ability to manage operations and reputational, competitive, or business harm, which may adversely affect our business operations or financial results. In addition, such events could result in unauthorized disclosure of material confidential information, and we may suffer financial and reputational damage because of lost or misappropriated confidential information belonging to us or to our partners, our employees, customers, suppliers, or consumers. In any of these events, we could also be required to spend significant financial and other resources to remedy the damage caused by a security breach or to repair or replace networks and IT systems, which could require a significant amount of time. Negative publicity could affect our stock price and business performance. Unfavorable publicity, whether accurate or not, related to our industry or to us or our brands, marketing, personnel, operations, business performance, or prospects could negatively affect our corporate reputation, stock price, ability to attract high-quality talent, or the performance of our business. Adverse publicity or negative commentary on social media outlets, particularly any that go “viral,” could cause consumers to react by avoiding our brands or choosing brands offered by our competitors, which could materially negatively affect our financial results. Our failure to attract or retain key executive or employee talent could adversely affect our business. Our success depends upon the efforts and abilities of our senior management team, other key employees, and our high-quality employee base, as well as our ability to attract, motivate, reward, and retain them. Difficulties in hiring or retaining key executive or other employee talent, or the unexpected loss of experienced employees resulting in the depletion of our institutional knowledge base, could have an adverse impact on our business performance, reputation, financial condition, or results of operations. Given the changing demographics and increased demand for talent globally, we, as an American multinational company, may not be able to find the right people, at the right time, and in the right location, to achieve our business objectives. Additionally, companies like ours face increased labor costs as a result of aggressive hiring and/or inflated levels of compensation offered by other employers, especially in emerging markets – notably, India and Asia. The Brown family has the ability to control the outcome of matters submitted for stockholder approval. We are a “controlled company” under New York Stock Exchange rules. Controlled companies are exempt from New York Stock Exchange listing standards that require a board composed of a majority of independent directors, a fully independent nominating/corporate governance committee, and a fully independent compensation committee. We avail ourselves of the exemptions from having a board composed of a majority of independent directors and a fully independent nominating/corporate governance committee. Notwithstanding the available exemption, our Compensation Committee is composed exclusively of independent directors. As a result of our use of some “controlled company” exemptions, our corporate governance practices differ from those of non-controlled companies, which are subject to all of the New York Stock Exchange corporate governance requirements. We have two classes of common stock. Our Class A common stock is entitled to full voting powers, including in the elections of directors, while our Class B common stock may not vote except as provided by the laws of Delaware. We have had two classes of common stock since 1959, when our stockholders approved the issuance of two shares of Class B non-voting common stock to every holder of our voting common stock. Such dual class share structures have increasingly come under the scrutiny of major indices, institutional investors, and proxy advisory firms, with some calling for the reclassification of non-voting common stock. A majority of our voting stock is controlled by members of the Brown family, and, collectively, they have the ability to control the outcome of stockholder votes, including the election of all of our directors and the approval or rejection of any merger, change of control, or other significant corporate transactions. We believe that having a long-term-focused, committed, and engaged shareholder base provides us with an important strategic advantage, particularly in a business with aged products and multi-generational brands. This advantage could be eroded or lost, however, should Brown family members cease, collectively, to be controlling stockholders of the Company. We believe that it is in the interests of all shareholders that we remain independent and family-controlled, and we believe the Brown family stockholders share these interests. Thus, our common stock dual class share structure, as it has existed since 1959, is perpetual, and we do not have a sunset provision in our Restated Certificate of Incorporation or By-laws that provides for the eventual reclassification of the non-voting common stock to voting common stock. However, the Brown family’s interests may not always be aligned with other stockholders’ interests. By exercising their control, the Brown family could cause the Company to take actions that are at odds with the investment goals or interests of institutional, short-term, non-voting, or other non-controlling investors, or that have a negative effect on our stock price. Further, because the Brown family controls the majority of our voting stock, Brown-Forman might be a less attractive takeover target, which could adversely affect the market price of both our voting and our non-voting common stock. And the difference in voting rights for our common stock could also adversely and disproportionately affect the value of our Class B non-voting common stock to the extent that investors view, or any potential future purchaser of our Company views, the superior voting rights and control represented by the Class A common stock to have value. Our company-owned production facilities include distilleries, a winery, a concentrate plant, bottling plants, warehousing operations, sawmills, and cooperages. We also have agreements with other parties for contract production in Australia, Belgium, Brazil, China, Estonia, Finland, Ireland, Mexico, the Netherlands, South Africa, and the United States. United States: Irving, Texas; Irvine, California; Baltimore, Maryland; Atlanta, Georgia; San Rafael, California; and Washington, D.C.
International: Guadalajara, Mexico; Hamburg, Germany; Moscow, Russia; Warsaw, Poland; Sydney, Australia; São Paulo, Brazil; Paris, France; Prague, Czechia; Amsterdam, Netherlands; London, United Kingdom; Barcelona, Spain; Mexico City, Mexico; Seoul, South Korea; Gurgaon, India; Istanbul, Turkey; Shanghai, China; Hong Kong; Cape Town, South Africa; Dubai, United Arab Emirates; Kiev, Ukraine; and Tokyo, Japan. We believe that our facilities are in good condition and are adequate for our business. We operate in a litigious environment and we are sued in the normal course of business. We do not anticipate that any pending suits will have, individually or in the aggregate, a material adverse effect on our financial position, results of operations, or liquidity. Our Class A and Class B common stock is traded on the New York Stock Exchange under the symbols “BFA” and “BFB,” respectively. As of May 31, 2018, there were 2,639 holders of record of Class A common stock and 5,486 holders of record of Class B common stock. Because of overlapping ownership between classes, as of May 31, 2018, we had only 5,431 distinct common stockholders of record. 1. Amounts have been adjusted for a 5-for-4 stock split that occurred in February 2018. 2. Cash dividends for fiscal 2018 include a special dividend of $1.00 per share. The following table summarizes information as of April 30, 2018, about our equity compensation plans under which we have made grants of stock options, stock appreciation rights, restricted stock, market value units, performance units, or other equity awards. 1Includes 2,971,180 Class B common shares to be issued upon exercise of stock-settled stock appreciation rights (SSARs); 199,973 Class B common restricted stock units (RSUs); 114,703 Class A common deferred stock units (DSUs); and 79,681 Class B common DSUs issued under the Brown-Forman 2004 or 2013 Omnibus Compensation Plans. Does not include issued shares of performance-based restricted stock. SSARs are exercisable for an amount of our common stock with a value equal to the increase in the fair market value of the common stock from the date the SSARs were granted. The fair market value of our common stock at fiscal year-end has been used for the purposes of reporting the number of shares to be issued upon exercise of the 7,215,010 SSARs outstanding at fiscal year-end. 2RSUs and DSUs have no exercise price because their value depends on continued employment or service over time, and are to be settled for shares of Class B common stock. Accordingly, these have been disregarded for purposes of computing the weighted-average exercise price. 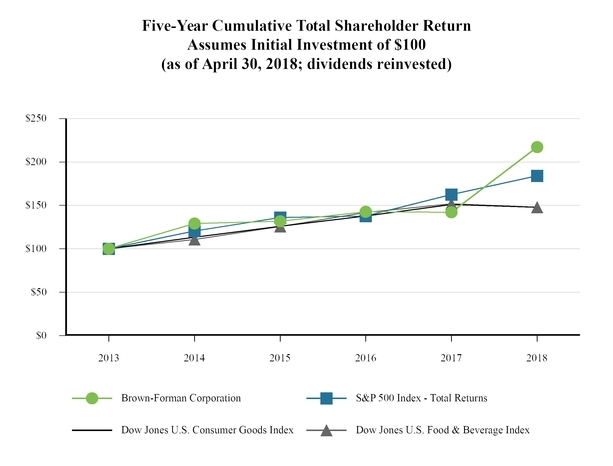 The graph below compares the cumulative total shareholder return of our Class B common stock for the last five years with the Standard & Poor’s 500 Index, the Dow Jones U.S. Consumer Goods Index, and the Dow Jones U.S. Food & Beverage Index. The information presented assumes an initial investment of $100 on April 30, 2013, and that all dividends were reinvested. The cumulative returns shown represent the value that each of these investments would have had on April 30 in the years since 2013. Includes the results of Southern Comfort and Tuaca, both of which were sold in March 2016 at a gain of $485 million (pre-tax). Includes the results of BenRiach since its acquisition in June 2016. Weighted average shares, earnings per share, and cash dividends declared per common share have been adjusted for a 2-for-1 stock split in August 2016 and a 5-for-4 stock split in February 2018. See “Item 7. Management’s Discussion and Analysis of Financial Condition and Results of Operation – Non-GAAP Financial Measures” for details on our use of “return on average invested capital,” including how we calculate this measure and why we think this information is useful to readers. Cash dividends declared per common share include a special cash dividend of $1.00 in fiscal 2018. We define dividend payout ratio as cash dividends divided by net income. This Management’s Discussion and Analysis of Financial Condition and Results of Operations (MD&A) is intended to help the reader better understand Brown-Forman, our operations, our financial results, and our current business environment. Please read this MD&A in conjunction with our Consolidated Financial Statements and the accompanying Notes contained in “Item 8. Financial Statements and Supplementary Data” (the Consolidated Financial Statements). All share and per share amounts have been adjusted for a 5-for-4 stock split in February 2018 (see Note 10 to the Consolidated Financial Statements for additional information). Presentation basis. This MD&A reflects the basis of presentation described in Note 1 “Accounting Policies” to the Consolidated Financial Statements. In addition, we define statistical and non-GAAP financial measures that we believe help readers understand our results of operations and the trends affecting our business. Significant developments. We discuss developments during the most recent three fiscal years. Please read this section in conjunction with “Item 1. Business,” which provides a general description of our business and strategy. Executive summary. We discuss (a) fiscal 2018 highlights and (b) our outlook for fiscal 2019, including the trends, developments, and uncertainties that we expect to affect our business. Results of operations. We discuss (a) fiscal 2018 results for our largest markets, (b) fiscal 2018 results for our largest brands, and (c) the causes of year-over-year changes in our income statement line items, including transactions and other items that affect the comparability of our results, for fiscal years 2017 and 2018. Liquidity and capital resources. We discuss (a) the causes of year-over-year changes in cash flows from operating activities, investing activities, and financing activities; (b) recent and expected future capital expenditures; (c) dividends and share repurchases; and (d) our liquidity position, including capital resources available to us. Off-balance sheet arrangements and long-term obligations. Critical accounting policies and estimates. We discuss the critical accounting policies and estimates that require significant management judgment. We use some financial measures in this report that are not measures of financial performance under U.S. generally accepted accounting principles (GAAP). These non-GAAP measures, defined below, should be viewed as supplements to (not substitutes for) our results of operations and other measures reported under GAAP. Other companies may not define or calculate these non-GAAP measures in the same way. “Underlying change” in income statement measures. We present changes in certain income statement measures, or line items, that are adjusted to an “underlying” basis. We use “underlying change” for the following income statement measures: (a) underlying net sales; (b) underlying cost of sales; (c) underlying gross profit; (d) underlying advertising expenses; (e) underlying selling, general, and administrative (SG&A) expenses; (f) underlying other expense (income); (g) underlying operating expenses;1 and (h) underlying operating income. To calculate these measures, we adjust, as applicable, for (a) acquisitions and divestitures, (b) foreign exchange, (c) estimated net changes in distributor inventories, and (d) the establishment of our charitable foundation. We explain these adjustments below. “Acquisitions and divestitures.” This adjustment removes (a) any non-recurring effects related to our acquisitions and divestitures (e.g., transaction gains or losses, transaction costs, and integration costs), and (b) the effects of operating activity related to acquired and divested brands for periods not comparable year over year (non-comparable periods). By excluding non-comparable periods, we therefore include the effects of acquired and divested brands only to the extent that results are comparable year over year. 1Operating expenses include advertising expense, SG&A expense, and other expense (income), net. In fiscal 2016, we sold our Southern Comfort and Tuaca brands and related assets to Sazerac Company, Inc. and entered into a related transition services agreement (TSA). During fiscal 2017, we completed our obligations under the TSA. This adjustment removes the net sales, cost of sales, and operating expenses recognized in fiscal 2017 pursuant to the TSA related to contract bottling services and distribution services in certain markets. On June 1, 2016, we acquired The BenRiach Distillery Company Limited (BenRiach). This adjustment removes (a) transaction and integration costs related to the acquisition and (b) operating activity for the acquired business for the non-comparable period. With respect to comparisons of fiscal 2017 to fiscal 2016, the non-comparable period comprised all months; with respect to comparisons of fiscal 2018 to fiscal 2017, the non-comparable period is the month of May. “Foreign exchange.” We calculate the percentage change in our income statement line items in accordance with GAAP and adjust to exclude the cost or benefit of currency fluctuations. Adjusting for foreign exchange allows us to understand our business on a constant-dollar basis, as fluctuations in exchange rates can distort the underlying trend both positively and negatively. (In this report, “dollar” always means the U.S. dollar unless stated otherwise.) To eliminate the effect of foreign exchange fluctuations when comparing across periods, we translate current-year results at prior-year rates and remove foreign exchange gains and losses from current- and prior-year periods. “Estimated net change in distributor inventories.” This adjustment refers to the estimated net effect of changes in distributor inventories on changes in our income statement line items. For each period compared, we use volume information from our distributors to estimate the effect of distributor inventory changes on our income statement line items. “Foundation.” In the fourth quarter of fiscal 2018, we established the Brown-Forman Foundation (the Foundation) with an initial $70 million contribution to support the company’s charitable giving program in the communities where our employees live and work. This adjustment removes the initial $70 million contribution to the Foundation from our underlying SG&A expenses and underlying operating income to present our underlying results on a comparable basis. We use the non-GAAP measures “underlying change”: (a) to understand our performance from period to period on a consistent basis; (b) to compare our performance to that of our competitors; (c) in connection with management incentive compensation calculations; (d) in our planning and forecasting processes; and (e) in communications concerning our financial performance with the board of directors, stockholders, and investment analysts. We reconcile the “underlying changes in income statement measures” to their nearest GAAP measures in the tables below under “Results of Operations - Year-Over-Year Comparisons.” We have consistently applied the adjustments within our reconciliations in arriving at each non-GAAP measure. From time to time, to explain our results of operations or to highlight trends and uncertainties affecting our business, we aggregate markets according to stage of economic development as defined by the International Monetary Fund (IMF) and we aggregate brands by spirits category. Below, we define the aggregations used in this report. “Developed” markets are “advanced economies” as defined by the IMF. Our largest developed markets are the United States, the United Kingdom, and Australia. Developed international markets are developed markets excluding the United States. “Emerging” markets are “emerging and developing economies” as defined by the IMF. Our largest emerging markets are Mexico and Poland. “Rest of Europe” includes all markets in Europe and the Commonwealth of Independent States other than those specifically listed. “Remaining geographies” represents all markets (approximately 110) other than those specifically listed or included in “Rest of Europe,” with the largest being Brazil, South Africa, and China. “Travel Retail” represents our sales to global duty-free customers, travel retail customers, and the U.S. military. “Other non-branded” includes used barrel, bulk whiskey and wine, and contract bottling sales. “Premium bourbon” products include Woodford Reserve, Old Forester, and Coopers’ Craft. “Tequila” products include el Jimador, Herradura, New Mix, Pepe Lopez, and Antiguo. “Jack Daniel’s family of brands” includes Jack Daniel’s Tennessee Whiskey (JDTW), Jack Daniel’s RTD and RTP products (JD RTDs/RTP), Jack Daniel’s Tennessee Honey (JDTH), Gentleman Jack, Jack Daniel’s Tennessee Fire (JDTF), Jack Daniel’s Single Barrel Collection, Jack Daniel’s Tennessee Rye Whiskey (JDTR), Jack Daniel’s Sinatra Select, and Jack Daniel’s No. 27 Gold Tennessee Whiskey. “Jack Daniel’s RTDs/RTP” products include all RTD line extensions of Jack Daniel’s, such as Jack Daniel’s & Cola, Jack Daniel’s & Diet Cola, Jack & Ginger, Jack Daniel’s Country Cocktails, Gentleman Jack & Cola, Jack Daniel’s Double Jack, Jack Daniel’s American Serve, Jack Daniel’s Tennessee Honey RTD, Jack Daniel’s Cider (JD Cider), Jack Daniel’s Lynchburg Lemonade (JD Lynchburg Lemonade), and the seasonal Jack Daniel’s Winter Jack RTP. “Depletions.” We generally record revenues when we ship our products to our customers. Depending on our route-to-consumer (RTC), we ship products to either (a) retail or wholesale customers in owned distribution markets or (b) our distributor customers in other markets. “Depletions” is a term commonly used in the beverage alcohol industry to describe volume. Depending on the context, “depletions” means either (a) our shipments directly to retail or wholesale customers for owned distribution markets or (b) shipments from our distributor customers to retailers and wholesalers in other markets. We believe that depletions measure volume in a way that more closely reflects consumer demand than our shipments to distributor customers do. In this document, unless otherwise specified, we refer to “depletions” when discussing volume. “Consumer takeaway.” When discussing trends in the market, we refer to “consumer takeaway,” a term commonly used in the beverage alcohol industry. “Consumer takeaway” refers to the purchase of product by the consumer from a retail outlet as measured by volume or retail sales value. This information is provided by third parties, such as Nielsen and the National Alcohol Beverage Control Association (NABCA). Our estimates of market share or changes in market share are derived from consumer takeaway data using the retail sales value metric. “Return on average invested capital.” This measure refers to the sum of net income and after-tax interest expense, divided by average invested capital. Average invested capital equals assets less liabilities, excluding interest-bearing debt, and is calculated using the average of the most recent 13 month-end balances. After-tax interest expense equals interest expense multiplied by one minus our effective tax rate. We use this non-GAAP measure because we consider return on average invested capital to be a meaningful indicator of how effectively and efficiently we use capital invested in our business. We reconcile each of these measures to their nearest GAAP measures in the tables below under “Item 7. Management’s Discussion and Analysis of Financial Condition and Results of Operations – Executive Summary.” We have consistently applied the adjustments within our reconciliations in arriving at each non-GAAP measure. Below we discuss the significant developments in our business during fiscal 2016, fiscal 2017, and fiscal 2018. These developments relate to (a) innovation, (b) acquisitions and divestitures, and (c) capital deployment. We introduced our second Jack Daniel’s flavored whiskey product, JDTF, starting with the United States in late fiscal 2015. In fiscal 2016, we completed the U.S. launch and continued the global rollout of JDTF. In fiscal 2017, we expanded JDTF to markets including France, Germany, and Travel Retail. In fiscal 2018, we expanded JDTF to Brazil and Chile. In fiscal 2018, we introduced several new Jack Daniel’s RTD products, including Jack Daniel’s Southern Peach Country Cocktails in the United States, Jack Daniel’s Cider in the United Kingdom, and Jack Daniel’s Lynchburg Lemonade in Germany. These introductions all contributed to our Jack Daniel’s RTD growth in those markets. In fiscal 2018, we introduced JDTR, the first full-strength whiskey from the Jack Daniel’s family of brands in over two decades, in the United States and certain international markets. With this successful launch, our total Rye whiskey portfolio, including Woodford Reserve Rye Whiskey and Jack Daniel’s Single Barrel Rye, surpassed 100,000 nine-liter cases in fiscal 2018. Other American whiskeys. We continue to capitalize on consumers’ interest in super- and ultra-premium whiskey with our range of brands, including Woodford Reserve and Old Forester. In fiscal 2017, we unveiled new packaging for Woodford Reserve Double Oaked, the most successful line extension from Woodford Reserve to date (first introduced in 2012). The Double Oaked variant of Woodford Reserve continued to contribute meaningfully to the brand’s growth and reached nearly 50,000 nine-liter cases in fiscal 2018. From fiscal 2015 to fiscal 2017, we introduced three Old Forester craft expressions in our Old Forester Whiskey Row Series. In fiscal 2018, we added Old Forester Statesman, which won a double gold medal at the 2018 San Francisco World Spirits Competition. In addition, we launched new packaging for our core Old Forester bourbons in February 2017. Our founding brand grew net sales by more than 35% per year from fiscal 2015 through fiscal 2018. Also in fiscal 2017, we introduced our first entirely new bourbon in 20 years, Coopers’ Craft, a super-premium brand now in limited distribution in the United States. Tequila brands. We experienced another record year for our tequila brands in fiscal 2018, as Herradura, el Jimador, and New Mix contributed significantly to our overall net sales growth. In fiscal 2015, we released Herradura Ultra to participate in the fast-growing market for ultra-premium “cristalino” tequilas in Mexico, and it has been a significant driver of our tequila growth during the last four fiscal years, surpassing 70,000 nine-liter cases in fiscal 2018. In June 2015, we purchased all of the shares of Slane Castle Irish Whiskey Limited. In April 2017, we unveiled the first product from our Slane Irish Whiskey brand in Travel Retail in Ireland, and we introduced the brand selectively in the United States, the United Kingdom, and Australia in the summer of 2017. In fiscal 2019, we plan to expand Slane nationally in the United States. In March 2016, we sold our Southern Comfort and Tuaca brands and related assets to Sazerac Company, Inc. for $543 million in cash, which resulted in a gain of $485 million in the fourth quarter of fiscal 2016. We substantially completed all activities related to this transition of ownership in fiscal 2017. See ‘‘Executive Summary’’ below and Note 15 to the Consolidated Financial Statements for additional information about the financial impact of the sale of Southern Comfort and Tuaca. Kingdom, Taiwan, Germany, and Travel Retail. See Note 16 to the Consolidated Financial Statements for additional information. Beyond the acquisition and divestiture activities described above, we have focused our capital deployment initiatives on (a) enabling the expected future growth of our existing businesses through investments in our production capacity, barrel whiskey inventory, and brand-building efforts; and (b) returning cash to our shareholders. Jack Daniel’s. We continued to expand our shipping warehouse facility and built an additional warehouse. Woodford Reserve. We expanded our bottling facility and built four new warehouses. Old Forester. We continued construction of the Old Forester Distillery and visitors’ center on Main Street in Louisville, Kentucky, which we expect to open in June 2018. Slane Irish Whiskey. We opened a consumer experience on the historic Slane Castle Estate in the fall of 2017. We also continued building a new distillery, which we expect to open in the summer of 2018. Debt and equity transactions. From fiscal 2016 through fiscal 2018, we returned $3.0 billion to our shareholders through $0.8 billion in regular quarterly dividends, $0.5 billion in special dividends, and $1.7 billion in share repurchases. We financed our dividends and repurchases with cash on hand and proceeds from the issuance of long-term debt totaling $1.8 billion (net). We delivered net sales of $3.2 billion, an increase of 8% compared to fiscal 2017. Excluding (a) the positive effect of foreign exchange driven by the strengthening of the euro, Polish zloty, and Mexican peso and (b) an estimated net increase in distributor inventories in the United States, we grew underlying net sales 6%. From a brand perspective, our underlying net sales growth was driven by the Jack Daniel’s family of brands, our premium bourbon brands, and our tequila brands. From a geographic perspective, the United States and emerging markets led the growth in underlying net sales, while developed international markets also accelerated underlying net sales growth compared to fiscal 2017. We delivered operating income of $1.0 billion, an increase of 5% compared to fiscal 2017. Excluding the impact of (a) the $70 million contribution to establish the Foundation, (b) the positive effect of foreign exchange, and (c) an estimated net increase in distributor inventories, underlying operating income grew 8%. We delivered diluted earnings per share of $1.48, an increase of 8% compared to fiscal 2017 due to an increase in reported operating income and a reduction in our effective tax rate. Our return on average invested capital increased to 20.0% in fiscal 2018, compared to 19.8% in fiscal 2017. 1See “Non-GAAP Financial Measures” above for details on our use of “underlying changes,” including how we calculate these measures and why we think this information is useful to readers. 2Operating expenses include advertising expense, SG&A expense, and other expense (income), net. 3Year-over-year changes in percentages are reported in percentage points (pp). 4See “Non-GAAP Financial Measures” above for details on our use of “return on average invested capital,” including how we calculate this measure and why we think this information is useful to readers. We are optimistic about our prospects for growth of net sales, operating income, and diluted earnings per share in fiscal 2019. Below we discuss our current expectations for fiscal 2019, including trends, developments, and uncertainties that we expect may affect our business. When we provide guidance for underlying change for the following income statement measures we do not provide guidance for the corresponding GAAP change because the GAAP measure will include items that are difficult to quantify or predict with reasonable certainty, including the estimated net change in distributor inventories and foreign exchange, each of which could have a significant impact to our GAAP income statement measures. Underlying net sales. We expect the underlying net sales growth rate trend from fiscal 2018 to continue. We anticipate the Jack Daniel’s family of brands, our portfolio of premium bourbons, and our tequila brands to again drive our growth. We expect that volume will be the most significant driver of underlying net sales growth in fiscal 2019. Underlying expenses. We expect total underlying expenses to grow more slowly than net sales. In addition, we expect: (a) for underlying cost of sales, input costs should increase in the mid-single digits, (b) underlying advertising expenses should grow at a rate similar to our net sales growth rate, and (c) underlying SG&A expenses to be approximately unchanged compared to fiscal 2018.
under the new standard, we will estimate and recognize the cost of certain customer incentives earlier than we have historically. Although we expect this change in timing to shift the recognition of these costs among fiscal quarters, we do not expect the full-year impact to be significant. Additionally, some payments to customers previously classified as advertising or SG&A expenses will be classified as reductions of net sales under the new standard. We anticipate the impact of this change in classification to be insignificant. See Note 1 to the Consolidated Financial Statements for additional information. Productivity and efficiency initiative. In June 2017, we announced a three-year (fiscal 2018 – fiscal 2020) cost-saving and productivity initiative to deliver sustainable cost savings and accelerate our net sales growth rate. We expect to invest a portion of the cost savings generated by the initiative in incremental advertising and promotional activities. Our fiscal 2019 outlook reflects this initiative’s expected effects. Foreign exchange. In fiscal 2018, our reported results were helped by foreign exchange due to the weakening of the U.S. dollar. We cannot predict the movement of foreign exchange rates with reasonable certainty; however, considering spot rates as of April 30, 2018, we expect a modest negative effect to our fiscal 2019 results. See “Item 7A. Quantitative and Qualitative Disclosures about Market Risk” for details about foreign exchange and our business. Tax Act. In December 2017, the U.S. government enacted the Tax Cuts and Jobs Act (Tax Act), which significantly revises the U.S. corporate income tax by lowering the U.S. corporate income tax rate. During fiscal 2018, we recorded a provisional net charge of $43 million related to the transitional impacts of the Tax Act. Our fiscal 2019 effective tax rate will not include these transitional impacts of the Tax Act and will include a full year of the lower U.S. corporate income tax rate. See Note 12 to the Consolidated Financial Statements for additional information. Foundation. In fiscal 2018, we established the Brown-Forman Foundation with an initial contribution of $70 million, which we do not expect to repeat in fiscal 2019. The expense recorded to establish the Foundation was removed from our underlying change in fiscal 2018 SG&A and operating income measures. See “Non-GAAP Financial Measures” above for details. Tariffs. In response to the U.S. tariffs on steel and aluminum, the European Union and several other countries including Canada, China, Russia, and Turkey have threatened retaliatory tariffs. In addition, Mexico has imposed retaliatory tariffs on U.S. goods, including American whiskey. We have a significant U.S. manufacturing base and export our American whiskeys around the world. As the extent of any potential tariffs from key U.S. trading partners is uncertain, their potential impact on our business is unknown. We continue to monitor this situation and consider measures to mitigate risk. The following table shows net sales results for our ten largest markets, summarized by geographic area, for fiscal 2018 compared to fiscal 2017. We discuss the most significant changes in net sales for each market. 1See “Definitions” above for definitions of market aggregations presented here. 2See “Non-GAAP Financial Measures” above for details on our use of “underlying change” in net sales, including how we calculate this measure and why we believe this information is useful to readers. The United States, our most important market, accounted for 47% of our reported net sales in fiscal 2018, down from 48% in fiscal 2017. In fiscal 2018, reported net sales in the United States grew 7%, while underlying net sales increased 5%, after adjusting for an estimated net increase in distributor inventories. Underlying net sales gains were fueled by (a) the Jack Daniel’s family of brands, led by JDTW, JDTH, and the launch of JDTR; (b) our premium bourbon brands, led by Woodford Reserve and Old Forester; and (c) the growth of our tequila brands. This growth was partially offset by declines of Korbel Champagne and Canadian Mist. Europe accounted for 27% of our reported net sales in fiscal 2018, up from 26% in fiscal 2017. For fiscal 2018, reported net sales in Europe increased 12%, while underlying net sales grew 8%, after adjusting for the positive effect of foreign exchange driven by the weakening of the dollar against the euro, Polish zloty, British pound, and Turkish lira. Underlying net sales growth was driven by gains in Germany, Russia, France, Poland, Turkey, the United Kingdom, and Spain. In the United Kingdom, underlying net sales growth was driven by the launch of JD Cider and higher volumes of JDTW. In Germany, underlying net sales growth was driven by higher volumes, higher prices, and favorable mix of JD RTDs and JDTW. JD RTDs benefited from the launch of JD Lynchburg Lemonade RTD in fiscal 2018. In Poland, higher volumes of JDTW fueled underlying net sales growth driven by strong consumer takeaway trends. In Russia, underlying net sales growth was driven by higher pricing on Finlandia, partially offset by declines of JDTW. The higher price of Finlandia is partly attributed to import duties resulting from a change in our RTC in fiscal 2017. Underlying net sales growth in the rest of Europe was led by increases in Turkey, Spain, and Ukraine. Growth in Spain has accelerated in fiscal 2018 following our strategic investment in a new distribution operation. Australia accounted for 5% of our reported net sales in both fiscal 2018 and fiscal 2017. In fiscal 2018, reported net sales grew 8%, while underlying net sales also increased 8% after adjusting for the positive effect of foreign exchange and the offsetting loss of net sales related to our TSA for Southern Comfort and Tuaca. Underlying net sales growth was led by higher prices of our core JD RTD brands, Jack Daniel’s & Cola and Jack Daniel’s Double Jack, along with volumetric growth of JDTW. Net sales for our other geographies constituted 14% of our reported net sales in both fiscal 2018 and fiscal 2017. Reported net sales increased 10% in fiscal 2018 and underlying net sales were up 9% after adjusting reported results for the positive effect of foreign exchange driven by the weakening of the dollar against the Mexican peso and an estimated net decrease in distributor inventories. Underlying net sales growth was led by Mexico, Brazil, and China, partially offset by declines in Japan. Travel Retail accounted for 4% of our reported net sales in fiscal 2018 and fiscal 2017. Reported net sales increased 13% in fiscal 2018 and underlying net sales increased 8% after adjusting for an estimated net increase in distributor inventories. Underlying net sales growth in fiscal 2018 was driven by increased travel, stabilization of foreign exchange, and increased promotional activity resulting in higher volumes of JDTW, Woodford Reserve, and Gentleman Jack. Other non-branded accounted for 3% of our reported net sales in both fiscal 2018 and fiscal 2017. Reported net sales decreased 2%, while underlying net sales grew 9% after removing the net effect of acquired and divested businesses (primarily contract bottling sales related to our TSA agreement) and the positive effect of foreign exchange. The increase in underlying net sales was driven by higher volumes of used barrel sales and an increase in bulk whiskey sales, partially offset by declines in contract bottling sales. The following table highlights the worldwide results of our largest brands for fiscal 2018 compared to fiscal 2017. We discuss results of the brands most affecting our performance below the table. 1See “Definitions” above for definitions of brand aggregations and volume measures presented here. Jack Daniel’s Tennessee Whiskey generates a significant percentage of our total net sales, and is our top priority. JDTW is the largest brand in the world priced over $25 per 750 ml per bottle1 and the world’s fourth-largest premium spirits brand measured by both volume and retail value.2 During calendar 2017, JDTW grew volume for the 26th consecutive year2 and, among the top five premium spirits brands on the list, Jack Daniel’s Tennessee Whiskey was the only one to grow volume in each of the past five years1 – an achievement that underscores our belief in the brand’s sustainable appeal and long-term growth potential. JDTW grew volumes 5% globally in fiscal 2018, a significant increase from its 1% growth rate in fiscal 2017. JDTW reported net sales grew 6%, while underlying net sales increased 4% led by the United States, Brazil, Poland, Turkey, France, Travel Retail, Germany, and Australia. Since its introduction in late fiscal 2011, Jack Daniel’s Tennessee Honey has contributed significantly to our net sales growth. JDTH is now the 15th largest brand in the world priced over $25 per 750ml bottle.1 In fiscal 2018, JDTH grew volumes by 8%, on top of the 6% growth rate last fiscal year. The brand grew reported net sales 10% and underlying net sales 9%, driven by higher volumes in the United States and France. 2Based on industry statistics published by Impact Databank, a well-known U.S. trade publication, in March 2018. The Jack Daniel’s RTDs/RTP brands grew volume 9%, reported net sales 15%, and underlying net sales 14% in fiscal 2018. JD RTDs’ underlying net sales growth was driven by higher prices in Australia and consumer-led volumetric gains and product innovation in Germany, the United States, and the United Kingdom. Gentleman Jack grew volumes 7% in fiscal 2018 and surpassed 600 thousand nine-liter cases entering its 30th year of production. The brand grew reported net sales 9% and underlying net sales 7%, driven by volumetric growth in the United States and Travel Retail, as increased media propelled stronger sales in fiscal 2018 compared to fiscal 2017. Jack Daniel’s Tennessee Fire grew volumes 14%, reported net sales 20%, and underlying net sales 15% in fiscal 2018. Underlying net sales growth was led by the United States, along with expansion into Brazil and Chile. JDTF has grown volumes each year since its introduction in late fiscal 2015. Our Other Jack Daniel’s whiskey brands reported net sales grew 26% and underlying net sales increased 13%, fueled by the launch of JDTR in the fall of 2017. Woodford Reserve grew volumes 23% in fiscal 2018 (after growing 18% in fiscal 2017 and 26% in fiscal 2016) and was once again selected as an Impact’s “Hot Brand.”1 In addition, reported net sales increased 26% and underlying net sales grew 22% in fiscal 2018. The United States is by far the brand’s most important market and was responsible for most of its growth during fiscal 2018. However, the brand continued its momentum outside the United States, growing volumes 21%, driven by Travel Retail. We believe Woodford Reserve is the leading super-premium American whiskey globally, and is poised for continued growth as interest in bourbon continues to increase around the world. During fiscal 2018, Woodford Reserve became the official sponsor of the Kentucky Derby. We plan to continue devoting substantial resources to Woodford Reserve to support its growth potential, including sustained advertising and capital investments. Finlandia grew volumes 2% in fiscal 2018, while reported net sales increased 10%, and underlying net sales grew 5% after adjusting for the positive effect of foreign exchange and an estimated net increase in distributor inventories in Russia. The increase in underlying net sales was driven predominantly by higher prices in Russia, which was partly attributed to import duties resulting from a change in our route-to-consumer. el Jimador grew volumes 8% in fiscal 2018, while reported net sales increased 14%, and underlying net sales were up 9% after adjusting for the positive effect of foreign exchange due to the weakening of the dollar against the Mexican peso and an estimated net increase in distributor inventories in the United States. Underlying net sales growth was driven by higher volumes in the United States, where el Jimador remained on the Impact’s “Hot Brands” list1 in calendar 2017. Herradura grew volumes 15% in fiscal 2018, while reported net sales increased 17%, and underlying net sales were up 19% after adjusting for the positive effect of foreign exchange due to the weakening of the dollar against the Mexican peso and an estimated net decrease in distributor inventories in the United States. This growth was driven primarily by increased volumes and higher prices in the brand’s largest markets, the United States and Mexico. Mexico also benefited from consumer-led volumetric growth of Herradura Ultra, our “cristalino” tequila expression released in fiscal 2015. We remain focused on developing Herradura in the United States (where we continue to see considerable potential for growth), strengthening our position in Mexico, and continuing to build our presence in higher-value tequila markets throughout the world. 1Impact Databank published the Impact’s “Hot Brands - Spirits” list in March 2018. Net sales of $3,248 million increased 8%, or $254 million, in fiscal 2018 compared to fiscal 2017. After adjusting reported results for the positive effect of foreign exchange and an estimated net increase in distributor inventories, underlying net sales grew 6%. The positive effect of foreign exchange was driven primarily by the dollar’s weakening against the euro, Polish zloty, and Mexican peso. Of the 6% change in underlying net sales, 5% was attributable to volume growth and nearly 2% was attributable to the positive impact of price/mix. Volume growth was led by the Jack Daniel's family of brands, tequilas, and premium bourbons. Improved price/mix was driven by (a) an increase in the share of sales of higher margin brands, most notably the Jack Daniel’s family of brands and Woodford Reserve, and (b) higher average pricing on JD RTDs and tequilas. Woodford Reserve outside of the United States, driven by Travel Retail. Canadian Mist volumes in the United States. Net sales of $2,994 million decreased 3%, or $95 million, in fiscal 2017 compared to fiscal 2016. After adjusting reported results for (a) the net effect of acquisitions and divestitures, (b) the negative effect of foreign exchange, and (c) the estimated net decrease in distributor inventories, underlying net sales grew 3%. The negative effect of foreign exchange was driven primarily by the dollar’s strengthening against the Mexican peso, euro, and British pound. The change in underlying net sales was driven almost equally by the positive impact of price/mix and volume growth. Volume growth was led by the Jack Daniel's family of brands and the tequilas, partially offset by declines in Canadian Mist. Improved price/mix was driven by (a) higher average pricing on JDTW and the tequilas, and (b) a shift in sales out of lower-priced brands (most notably, Canadian Mist) to higher priced brands (most notably, Jack Daniel's family of brands and Woodford Reserve); these gains were partially offset by declines in used barrel sales. Woodford Reserve outside of the United States, driven by distribution expansion in Travel Retail. lower-margin agency brands that we no longer distribute. Cost of sales of $1,046 million increased $73 million, or 7%, in fiscal 2018 compared to fiscal 2017. Underlying cost of sales grew 8% after adjusting reported costs for (a) the net effect of our Scotch acquisition and the absence of sales related to our TSA for Southern Comfort and Tuaca and (b) an estimated net increase in distributor inventories. The increase in underlying costs of sales was driven by higher volumes and an increase in input costs, including wood and agave. Looking ahead to fiscal 2019, we currently expect that input costs will increase in the mid-single digits. Cost of sales of $973 million increased $28 million, or 3%, in fiscal 2017 compared to fiscal 2016. Underlying cost of sales grew 4% after adjusting reported costs for the estimated net change in distributor inventories. The increase in underlying costs of sales was driven by higher volumes and an increase in input costs, including wood and grain. Gross profit of $2,202 million increased $181 million, or 9%, in fiscal 2018 compared to fiscal 2017. Gross profit on an underlying basis improved 6% after adjusting reported gross profit for the positive effect of foreign exchange and an estimated net increase in distributor inventories. The increase in underlying gross profit resulted from the same factors that contributed to the increase in underlying net sales, partially offset by the same factors that drove higher underlying cost of sales. Gross margin increased to 67.8% in fiscal 2018, up 0.3 percentage points from 67.5% in fiscal 2017. The increase in gross margin was primarily due to (a) favorable price/mix, (b) the positive effect of foreign exchange, and (c) the net effect of acquisitions and divestitures, partially offset by an increase in underlying cost of sales. Gross profit of $2,021 million decreased $123 million, or 6%, in fiscal 2017 compared to fiscal 2016. Gross profit on an underlying basis improved 3% after adjusting reported gross profit for (a) the net effect of acquisitions and divestitures, (b) the negative effect of foreign exchange, and (c) the estimated net change in distributor inventories. The increase in underlying gross profit resulted from the same factors that contributed to the increase in underlying net sales, partially offset by the same factors that drove higher underlying cost of sales. Gross margin decreased to 67.5% in fiscal 2017, down 1.9 percentage points from 69.4% in fiscal 2016. The decrease in gross margin was primarily due to (a) the net effect of acquisitions and divestitures, (b) the negative effect of foreign exchange, and (c) an increase in underlying cost of sales. Operating expenses totaled $1,163 million and increased $131 million, or 13%, in fiscal 2018 compared to fiscal 2017. Underlying operating expenses grew 4% after adjusting for the establishment of the Foundation and the negative effect of foreign exchange. Advertising expenses of $414 million increased $31 million, or 8%, in fiscal 2018 compared to fiscal 2017. Underlying advertising expenses increased 6% after adjusting reported results for the negative effect of foreign exchange. The increase in underlying advertising expense was driven by higher spending on (a) our American whiskey portfolio in the United States, including JDTW, Woodford Reserve, Gentleman Jack, and the launch of JDTR; (b) the continued rollout of Slane Irish Whiskey in the United States; and (c) the expansion of our single-malt Scotch brands. SG&A expenses of $765 million increased $98 million, or 15%, in fiscal 2018 compared to fiscal 2017, while underlying SG&A increased 3% after adjusting reported results for the effect of our $70 million contribution to establish the Foundation and the negative effect of foreign exchange. The increase in underlying SG&A was driven by higher incentive compensation expenses and strategic investments, including our new Spain distribution operation, partially offset by lower pension expense and continued tight management of discretionary spending. Operating expenses as a percentage of net sales increased 1.3 percentage points to 35.8% in fiscal 2018, from 34.5% in fiscal 2017. Our operating expenses as a percentage of net sales increased driven by our $70 million contribution to establish the Foundation. Operating expenses totaled $1,032 million and decreased $64 million, or 6%, in fiscal 2017 compared to fiscal 2016. Underlying operating expenses declined 1% after adjusting for the net effect of acquisitions and divestitures and the positive effect of foreign exchange. Advertising expenses of $383 million decreased $34 million, or 8%, in fiscal 2017 compared to fiscal 2016. Underlying advertising expenses increased 2% after adjusting reported results for the net effect of acquisitions and divestitures and the positive effect of foreign exchange. The increase in underlying advertising expense was driven by higher spending on (a) JDTW, due in part to the 150th anniversary of Jack Daniel’s Distillery, (b) JD RTDs, partially due to new innovations, and (c) the launch of JDTF outside the United States. These increases were partially offset by lower spending for JDTF in the United States following the national introduction in late fiscal 2015 and for Finlandia Vodka. SG&A expenses of $667 million decreased $21 million, or 3%, in fiscal 2017 compared to fiscal 2016, while underlying SG&A dropped 2% after adjusting reported results for the positive effect of foreign exchange. The most significant contributors to the year-over-year decrease in underlying SG&A were lower compensation-related expenses and tight management of discretionary spending. Operating expenses as a percentage of net sales decreased 1.0 percentage point to 34.5% in fiscal 2017, from 35.5% in fiscal 2016. Our operating expenses as a percentage of net sales decreased driven by lower SG&A spend. Operating income was $1,039 million in fiscal 2018, an increase of $50 million, or 5%, compared to fiscal 2017. Underlying operating income growth was 8% after adjusting for (a) the establishment of the Foundation, (b) the positive effect of foreign exchange, and (c) an estimated net increase in distributor inventories, driven primarily by the United States. The same factors that contributed to the growth in underlying gross profit also contributed to the growth in underlying operating income, enhanced by meaningful operating expense leverage, as underlying SG&A spend grew 3% compared to underlying net sales growth of 6%. Operating margin declined 1.0 percentage point to 32.0% in fiscal 2018 from 33.0% in fiscal 2017. The decrease in our operating margin was primarily due to the 2.2 percentage point effect of the establishment of the Foundation, partially offset by operating expense leverage. Operating income was $989 million in fiscal 2017, a decrease of $544 million, or 35%, compared to fiscal 2016. Underlying operating income growth was 7% after adjusting for (a) the net effect of acquisitions and divestitures, (b) the negative effect of foreign exchange, and (c) the estimated net decrease in distributor inventories, driven primarily by the United States and Russia. The same factors that contributed to the growth in underlying gross profit also contributed to the growth in underlying operating income, enhanced by meaningful operating expense leverage, as SG&A spend declined and underlying advertising expenses grew 2% compared to underlying net sales growth of 3%. Operating margin declined 16.6 percentage points to 33.0% in fiscal 2017 from 49.6% in fiscal 2016. The decrease in our operating margin was primarily due to the net 16.6 percentage point effect of acquisitions and divestitures and the negative effect of foreign exchange, partially offset by a reduction in SG&A spend. Interest expense (net) increased $6 million, or 9%, in fiscal 2018 compared to fiscal 2017, due to a higher average long-term debt balance and a higher interest rate on our short-term borrowings. Our effective tax rate for fiscal 2018 was 26.6% compared to 28.3% in fiscal 2017. The decrease in our effective tax rate was driven by an increase in the beneficial impact of foreign earnings at lower rates and an increase in excess tax benefits related to stock-based compensation, partially offset by the net impact of the Tax Act. See Note 12 to the Consolidated Financial Statements for additional information. Diluted earnings per share were $1.48 in fiscal 2018, up 8% from $1.37 in fiscal 2017. This increase resulted from (a) an increase in reported operating income (net of a $0.10 decrease from the establishment of the Foundation) and (b) the benefit of a lower effective tax rate. Interest expense (net) increased $12 million, or 29%, in fiscal 2017 compared to fiscal 2016, primarily due to our July 2016 issuance of €300 million 1.20% and £300 million 2.60% senior unsecured notes due on July 7, 2026, and July 7, 2028, respectively. Our effective tax rates for fiscal 2017 and fiscal 2016 were 28.3%. An increase in the tax benefit related to discrete items and the beneficial impact of the excess tax benefits from stock-based awards decreased our effective tax rate. These were offset by (a) the absence of the beneficial impact of the sale of the Southern Comfort and Tuaca business, (b) a decrease in the beneficial impact of foreign earnings at lower tax rates, and (c) an increase in foreign exchange gains in non-U.S. entities that were currently subject to U.S. tax. Diluted earnings per share were $1.37 in fiscal 2017, down 34% from $2.09 in fiscal 2016. This decrease resulted from the same factors that contributed to the decrease in reported operating income, including (a) the absence of the $0.70 gain from the sale of Southern Comfort and Tuaca in fiscal 2016, (b) the absence of net income contribution from those brands, and (c) higher interest expense in fiscal 2017, partially offset by a reduction in shares outstanding due to share repurchases. Our ability to generate cash from operations consistently is one of our most significant financial strengths. Our strong cash flows enable us to invest in our people, invest in our brands, invest in our assets, pay dividends, make strategic acquisitions that we believe will enhance shareholder value, repurchase shares of common stock, and, from time to time, pay special dividends. Investment-grade credit ratings (A1 by Moody’s, A by Fitch, and A- by Standard & Poor’s) provide us with financial flexibility when accessing global credit markets. We believe cash flows from operations are sufficient to meet our expected operating and capital requirements for the foreseeable future. Cash and cash equivalents increased $57 million in fiscal 2018, compared to a decrease of $81 million in fiscal 2017. Cash provided by operations was down $7 million from fiscal 2017, as a $124 million increase in discretionary contributions to our pension plans was largely offset by higher earnings (net of a $70 million contribution to establish the Foundation) and a $66 million decline in income tax payments. The decline in income tax payments reflects the impact of the contributions to the pension plans and charitable foundation and the lower federal tax rates resulting from the enactment of the Tax Act. Cash used for investing activities was $128 million during fiscal 2018, compared to $422 million for the prior year. The $294 million decrease largely reflects $307 million in cash paid to acquire BenRiach in June 2016, partially offset by a $15 million increase in capital spending during the current year. The increase in capital spending is largely attributable to the construction of new distilleries and homeplaces for both Slane Irish Whiskey and Old Forester and to the modernization and automation of our Brown-Forman Cooperage operation. Cash used for financing activities was $466 million during fiscal 2018, compared to $285 million for fiscal 2017. The $181 million increase largely reflects a special cash dividend payment of $481 million in April 2018, the repayment of $250 million of notes that matured in January 2018, and a $122 million decrease in proceeds from long-term debt, partially offset by a $560 million decline in share repurchases and a $119 million decrease in net repayments of short-term borrowings. The impact on cash and cash equivalents as a result of exchange rate changes was an increase of $19 million for fiscal 2018, compared to a decline of $13 million in the prior fiscal year. increase of $855 million primarily reflected the impact of the sale of the Southern Comfort and Tuaca business (for which we received cash of $543 million) in fiscal 2016 and the acquisition of BenRiach (for which we paid cash of $307 million) in fiscal 2017. Cash used for financing activities was $285 million during fiscal 2017, compared to $1,060 million during fiscal 2016. The $775 million decrease in cash used for financing activities largely reflected a $546 million decrease in share repurchases and a $477 million increase in proceeds from long-term debt net of repayments, partially offset by a $202 million decline in net proceeds from short-term borrowings and the payment of $30 million in November 2016 to settle an obligation related to our acquisition of BenRiach. The impact on cash and cash equivalents as a result of exchange rate changes was a decline of $13 million for fiscal 2017, compared to a decline of $4 million in fiscal 2016. Over the past several fiscal years, we accelerated our capital spending in order to build the production platform for our current and future growth. Capital expenditures in three fiscal years from 2016 through 2018 were, on average, 32% higher than the average of the five fiscal years prior to 2016. We have invested capital to expand production capacity, to undertake new business initiatives, and to save costs. Significant capacity expansion projects included (a) the expansion of our shipping warehouse facility and an additional warehouse for Jack Daniel's, (b) an expanded bottling facility and four new warehouses for Woodford Reserve, and (c) a new wood mill. The integrated distillery and homeplaces projects for Old Forester and Slane Irish Whiskey were the major new business initiatives. The Slane Irish Whiskey consumer experience opened in the fall of 2017, and the distillery is expected to open in the summer of 2018. The Old Forester distillery is expected to open in June 2018. The most significant cost-saving initiative was the ongoing automation project at our Brown-Forman Cooperage facility. In fiscal 2019, we expect capital expenditures to be approximately $130 million. We expect capital expenditures in fiscal 2020 and fiscal 2021 to remain elevated as we complete several key, multi-year projects. We have repurchased approximately 57.7 million shares of our common stock under three separate repurchase programs since the beginning of fiscal 2014. The following table summarizes information about those share repurchases by period.